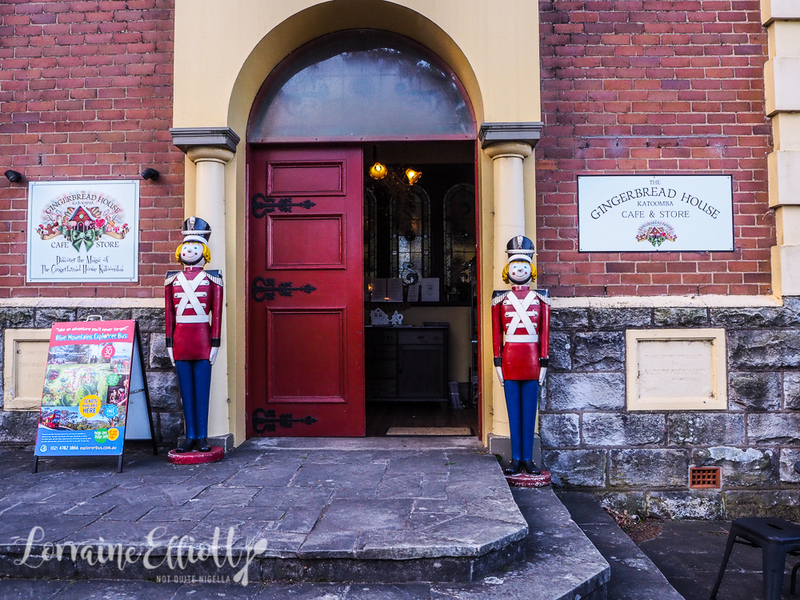 The Ultimate Blue Mountains Winter Wonderland Weekend! This post is brought to you by Visit NSW. 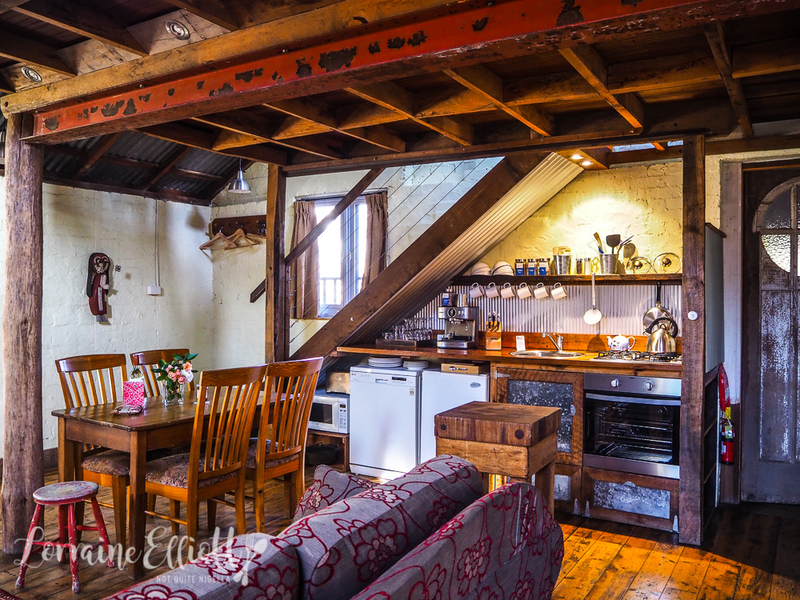 Looking for a short break in the Blue Mountains this winter? There's no shortage of fantastic places to eat, shop and sleep in the area! 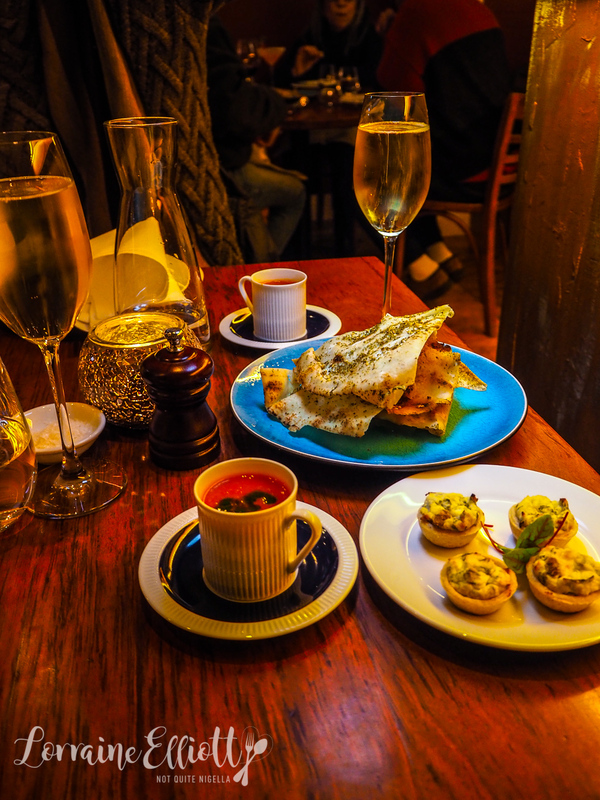 Take a look at how to warm up when it is snowing with this fun and delicious 48 hour itinerary! Shane McLaughlin from Hillbilly Cider pours a sample of "Sweet Julie" cider from the barrel. He points out just yonder towards Shields orchard where the Julie apple was discovered as a chance seedling (a genetically unique plant that comes from unintentional breeding). "Many people don't know this but most apples are created, not discovered," he says, "This is something quite special." The Julie apple is a picture perfect red apple-so perfect as it appears as though it is rendered in wax. And not since the Granny Smith apple was discovered in Sydney's Ryde in a compost heap in 1868 has there been this much excitement over an apple originating from the Sydney basin. 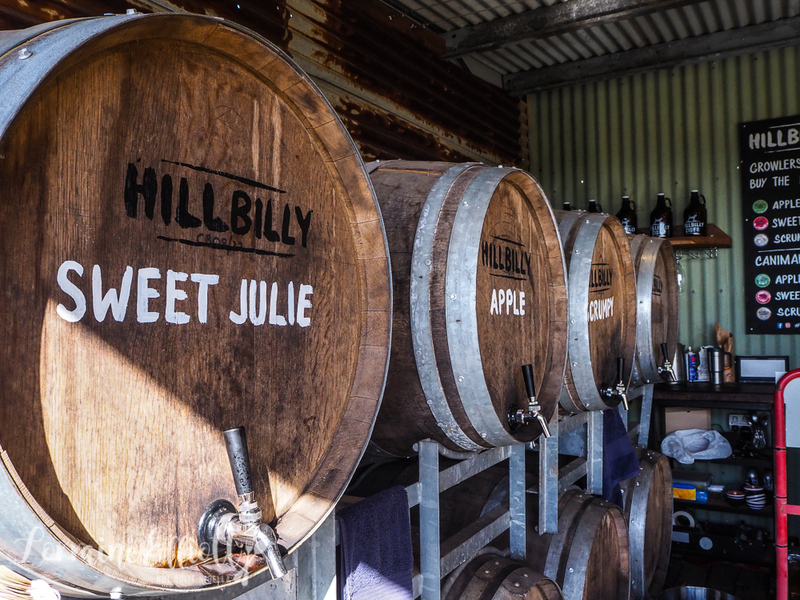 And it also makes for a remarkable cider that Hillbilly Cider named the Sweet Julie because it is sweet, clean and crisp. 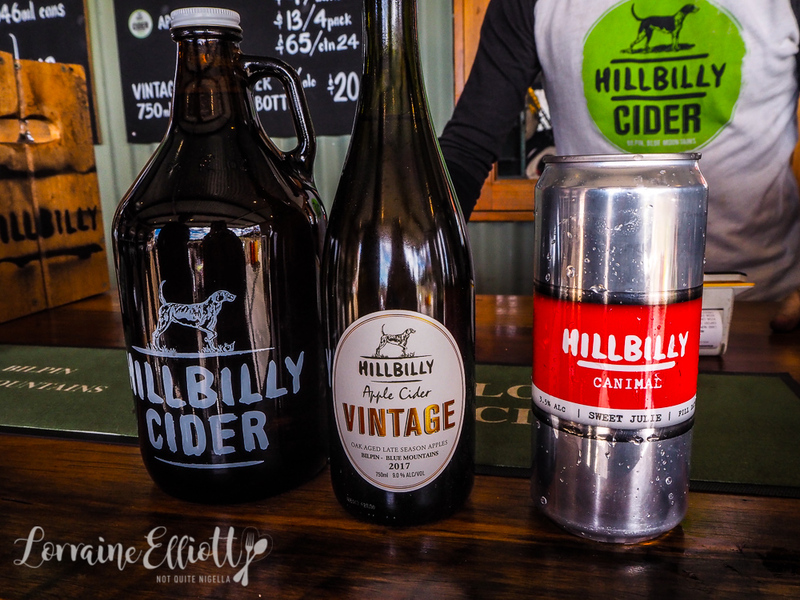 From Friday to Sunday, at Hillbilly guests can pull up a chair and sample their six ciders. If I liked their "Scrumpy" and traditional apple ciders that preceded it, I fall heads over heels for the Sweet Julie. The bouquet is remarkably bold and it smells of the sweetest, ripest pear juice (yes pear). 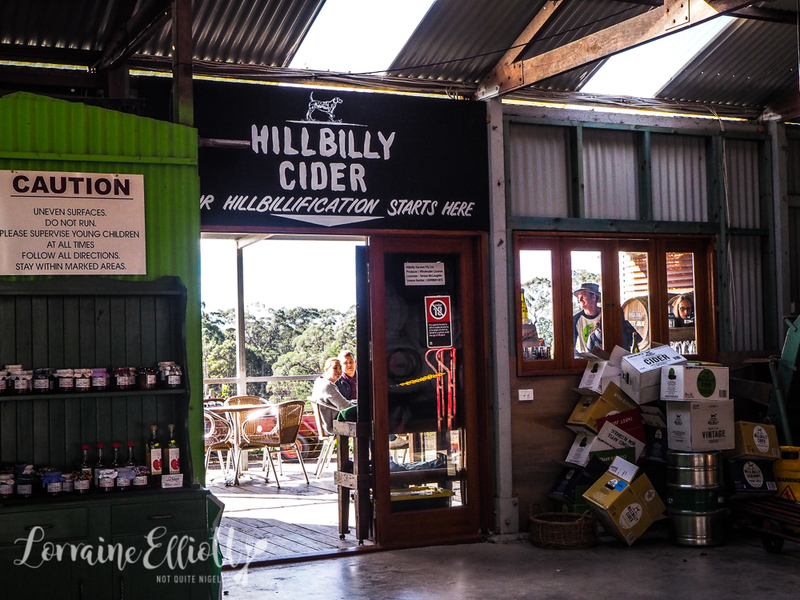 Hillbilly cider was named after Shane and Tessa McLaughlin moved here and their friends dubbed them hillbillies (although it's in jest as there is no hillbilliness detected). 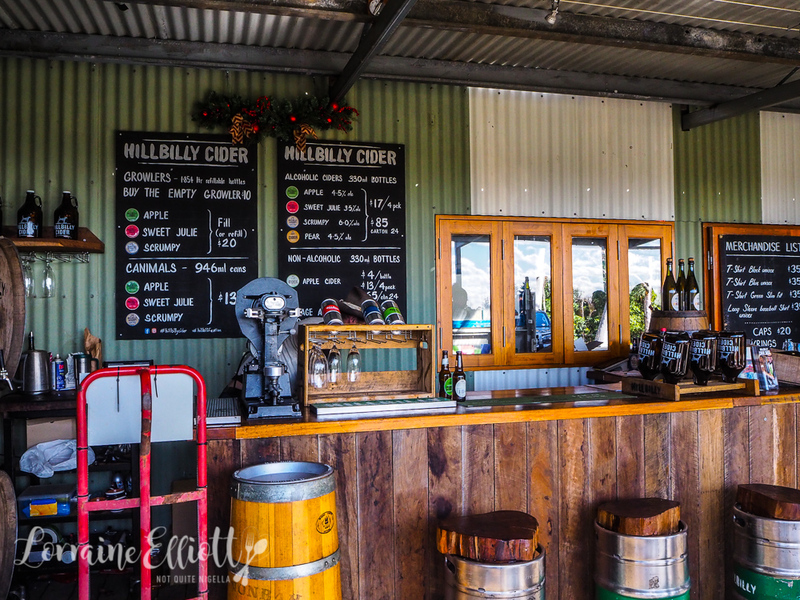 He was a fourth generation merino farmer who moved into wine for 21 years and it was this winemaking experience that gives them the edge for the cider that they make today. 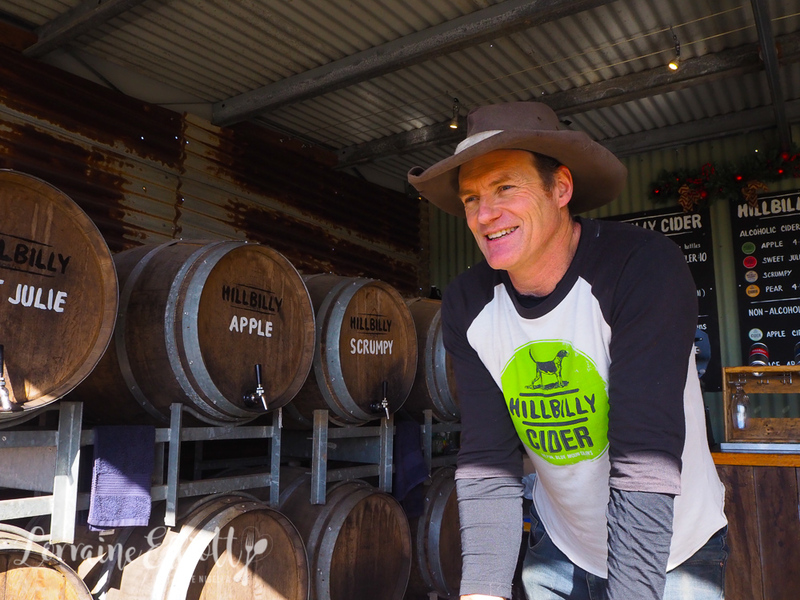 Shane explains that most cider sold in Australia is bulk made with sugars added to it. Yet craft cideries like Hillbilly cider make up just 10% of sales such is the distribution of the big brands. Here there is nothing added to the cider except for apples and pears to the perry (pear cider). Their cider is also naturally carbonated so there isn't any CO2 added, giving their ciders a delicate champagne bead. And the proof is in the tasting. The perry has a honeyed characteristic as the perry ages in the bottle and the acidity drops and plays a back seat role to the sugars while the apple ciders will change according to the time of the year and the apples used. Another interesting one is their "Scrumpy" (meaning "stolen fruit"). Here it is made of 7 or 8 varieties of Old English heritage apples from their 35 acre scrumpy orchard. And last but not least is the Apple Cider Vintage which is a double fermented cider which is clean and elegant and at 9% makes for a great lunch time drink. We end up with a growler and a Canimal (1 litre can) of Sweet Julie and a bottle of the vintage. And Shane invites us to come back February to April to pick apples fresh off the trees and March to try the Julie's - they say that there is nothing like an apple fresh from a tree! With our cider stash in tow we make the 20 minute drive to lunch at Mount Tomah's Botanical Gardens. We had visited here a few years ago a couple of times but the restaurant has changed hands and is now called The Potager. You can stop by for breakfast, lunch or just scones. Also, it's a very popular place-you're best to book ahead of time unless you don't mind eating outside where it can be very chillyduring winter, or wait 45 minutes for a table. Most people wander around the cool climate garden and come in for something warming to eat. 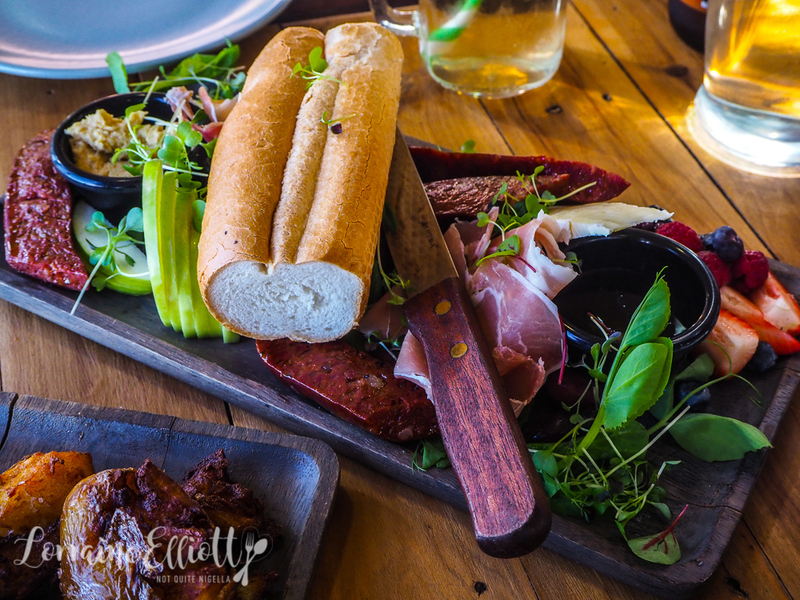 We start with a tasting board and there's half a baguette with folds of prosciutto, four chorizo halves, brie, hummus, olives, fresh fruit and local honey. It's a nice way to start with a generous amount of chorizo in particular. I would have loved the baguette to have been warmed or toasted though. I'm won over by the vegan and gluten free veggie patch which I didn't actually realise was vegan until they told us afterwards. 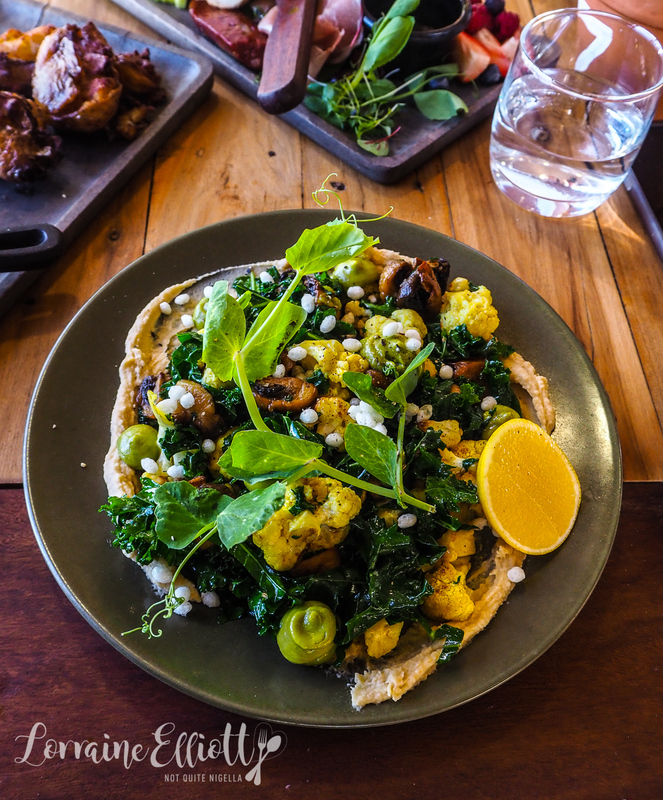 There's wilted kale and turmeric roasted cauliflower florets on a bed of hummus with sauteed garlic mushrooms, spicy avocado cream and puffed rice for texture. It's so wholesome yet full of flavour and well seasoned so you don't feel as though you're being healthy. 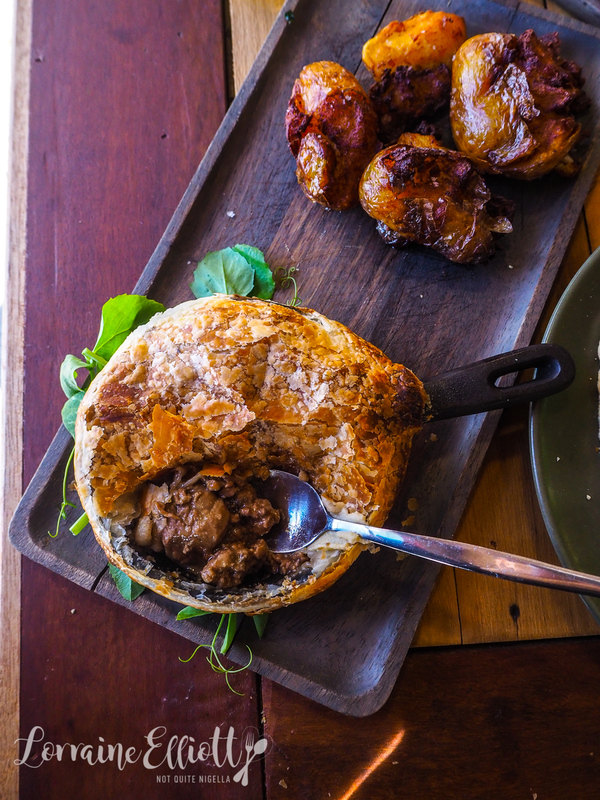 The pie of the day is a beef and vegetable one with a combination of minced beef and soft chunks of beef in a rich gravy with mushrooms and carrots. There's a lid of golden puff pastry on top and to the side are some truffled chat potatoes that are crunchy and moreish. These are a nice surprise as they weren't mentioned on the menu and when I saw the steak go past I had a bit of food envy when I saw the potatoes. We made sure to leave room for dessert. The honey pot is delicious although not quite a crème brûlée as it is called because there isn't a brûlée crust. It's a layer of honey cream topped with honey jelly and a cloud of honey drizzled double cream. 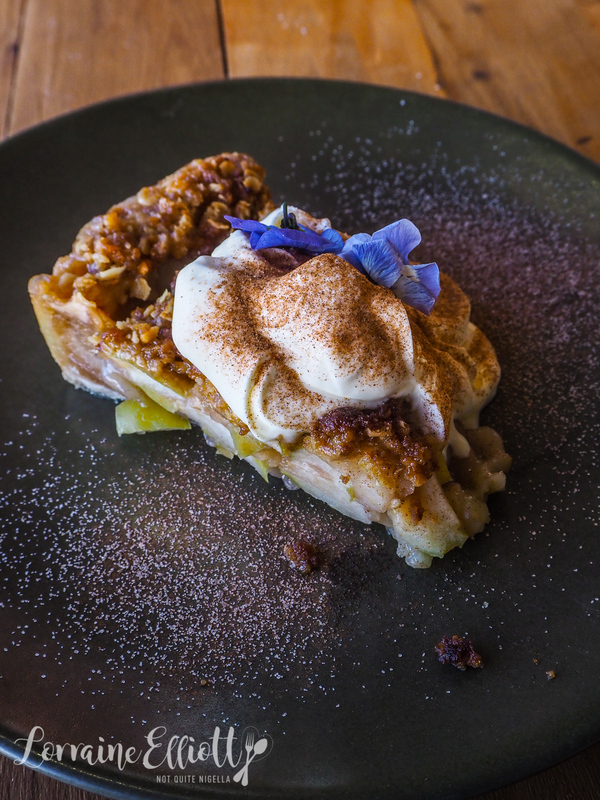 The apple pie is bursting with toothsome chunks of local Bilpin apples topped with a sweet oat crumb and served with a generous dollop of double cream and powdered cinnamon. Home for our stay here is at the Old Leura Dairy on Kings Road in Leura. 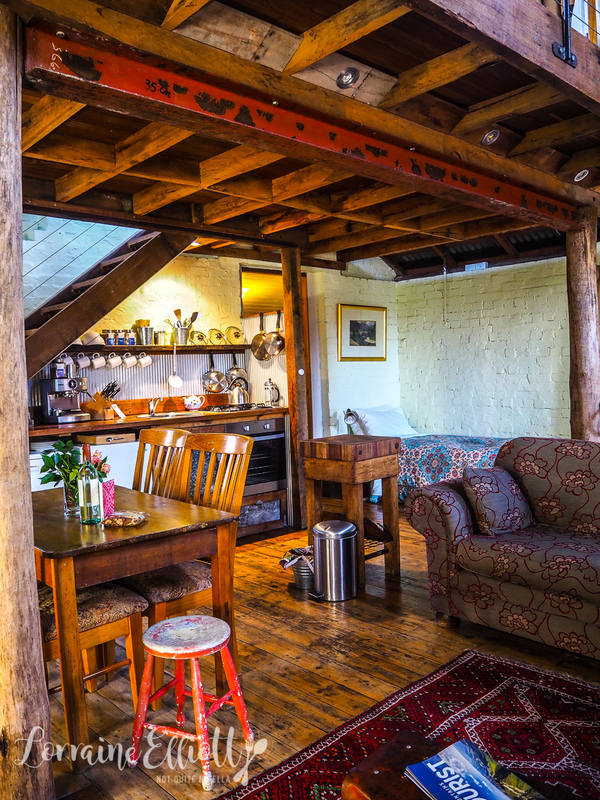 It is made up of several types of self contained accommodation and ours in the Milking Shed. We open up the huge rust coloured barn doors to reveal a loft style cottage. 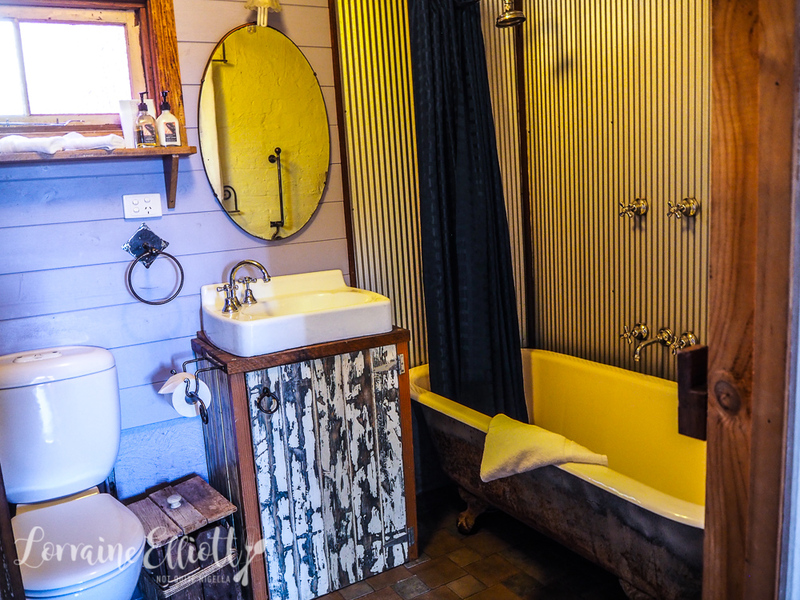 It's homely and welcoming with a kitchen, lounge room and two single beds downstairs along with the main bathroom with a claw foot tub and a separate WC. We're grateful to see that they've left both a heater and the fire on for us. 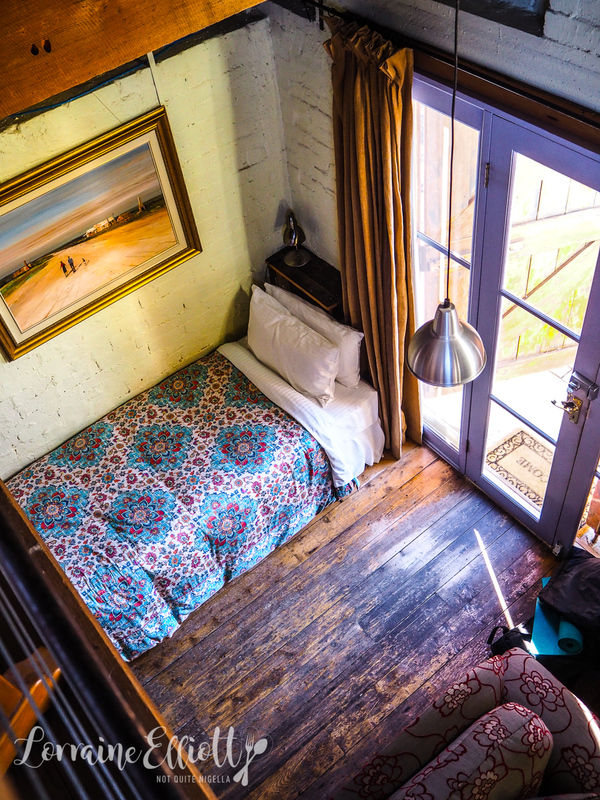 Upstairs is a king sized bed that is very comfortable. The bathroom can be a bit cold as there's no underfloor heating and insulation here isn't ideal. There are good quality basic toiletries. Internet is fast and free for unlimited devices and I busy myself making cups of tea while I task Mr NQN with making sure the fire keeps burning and doesn't turn off (a task he takes seriously as we have had arguments about fires). I spend the next couple of hours curled up in front of the fire under one of the doonas napping contentedly. Mr NQN goes for a brisk walk and returns stiff and chilled and he warms himself by the fire. 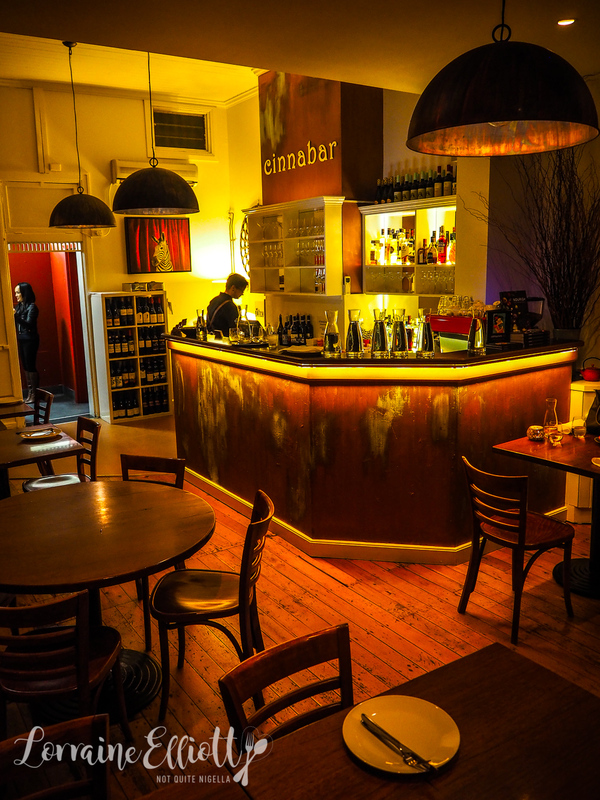 Dinner at Cinnabar in Blackheath that evening is a real treat. 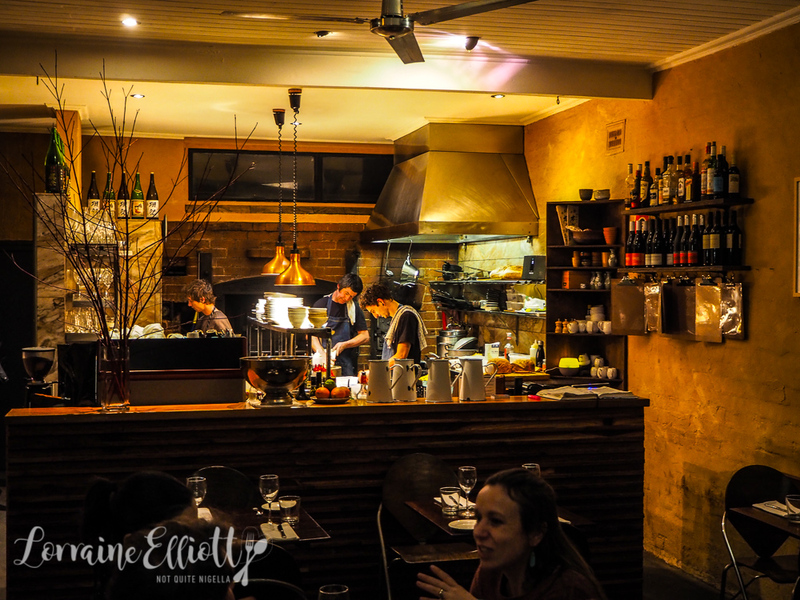 Usually when a menu claims to take you all around the world in one night, I get a sense of wariness but in this case Mary-Jane Craig from Cinnabar explains the concept was from her and Corinne Evatt's 45 years experience in various kitchens in the Blue Mountains. It is literally a collection of their greatest hits judged by their patrons that have followed them from place to place which is why the dishes are so good yet so diverse. You could be dining from Japan, Jamaica, Scandinavia or the Middle East. It does get very popular here so bookings are necessary for either their first or second seating. We start with some roasted tomato soup honeyed with saffron and finished with rocket oil. There's also za'atar dusted crispbread and little tartlets to get the appetite going. Mary-Jane and her staff expertly cater to everyone in the restaurant intuitively knowing just when people want to order. 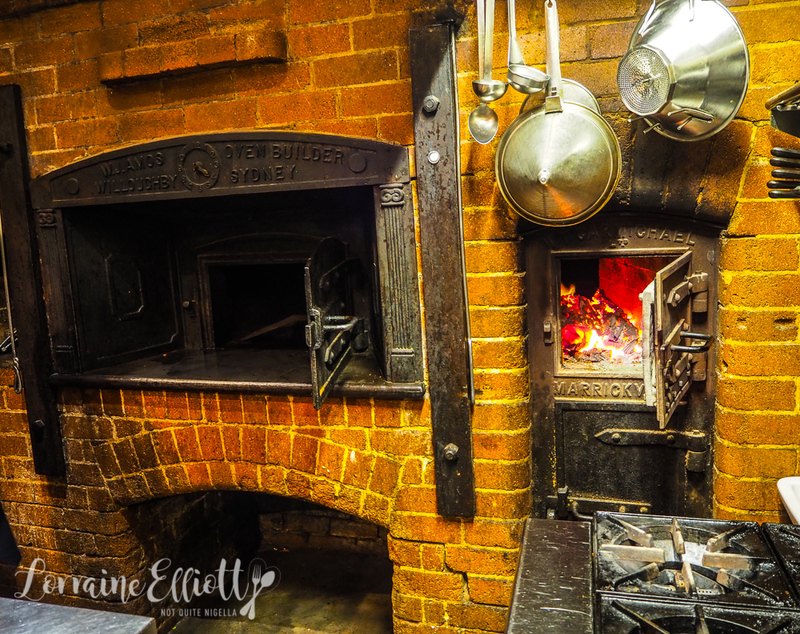 The atmosphere is warm and cosy and it makes you not want to leave. Courses tend to come out one at a time so this is really a menu designed to be shared among the table. We start with what ends up being one of my favourite dishes-the wild scallop tartare. 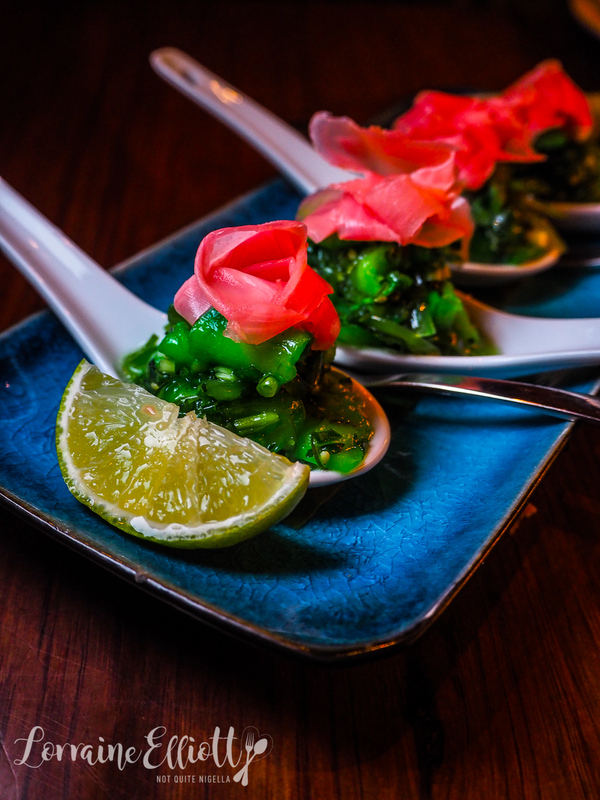 Here it is served in ceramic spoons, the North American wild scallops chopped up with wakame salad and topped with pickled ginger. It's refreshing and moreish and the perfect starter dish. On the other end of the spectrum, with the winds howling outside, nothing really beats a big, deep bowl of these poached spinach and ricotta dumplings in a creamy gorgonzola dolce sauce. 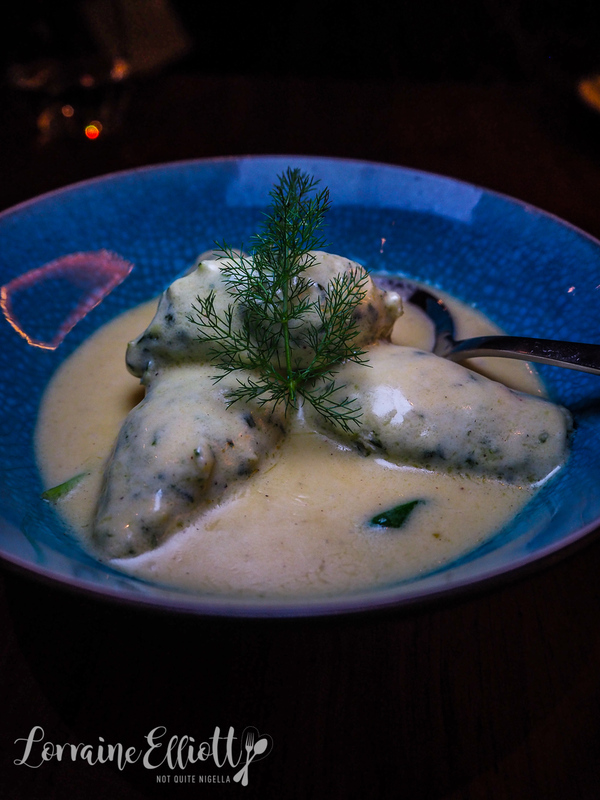 The dumplings are tender and melt in the mouth while the blue cheese sauce is mild and creamy. I only wish I had some spongy bread to soak up that creamy sauce. Next is my other favourite dish, the sizzling Jamaican spiced prawn pots. I have never been to Jamaica before so all I know of the food scene there is what I've eaten at Jamaican restaurants and of course the omnipresent jerk seasoning but this isn't a jerk seasoning. It's Corrine's own creation and it is so good that you may want to order two of these. The prawns have a perfect just cooked through texture and the seasonings and the side of herbed toum again make me want some crusty bread for the flavoured oil. They encourage us to have two courses per person share style and the last dish is our main which is served with the side dish. 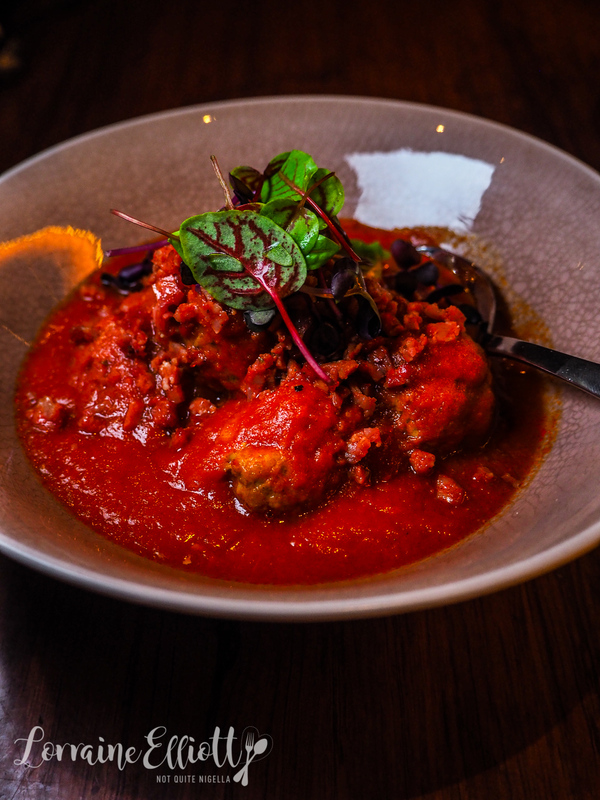 The Tunisian pork balls are served in a saffron tomato sauce with chorizo crumbs. The meatballs are plump and tender and the sauce is richly flavoured. The key is the richness of the sauce and the soft texture of the meatballs. We pair this with a side of Moroccan beetroot and orange blossom salad with a quenelle of harissa labneh. It's a refreshing salad that goes well with the meatballs. It's around 6°C outside and with the chilly walk to the car in mind we decide to go for the richest sounding pudding. 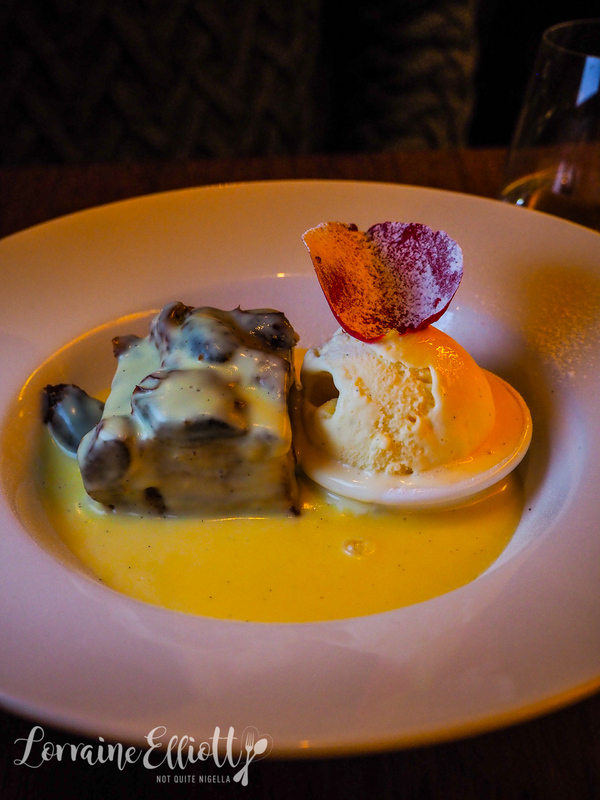 It's a warm Medjool date brioche pudding serves as a neat square with a creamy hot maple custard and ice cream. If anything could warm the cockles of your heart it is this. On the other end of the spectrum, yet no less satisfying, is one of Corinne's signature desserts. 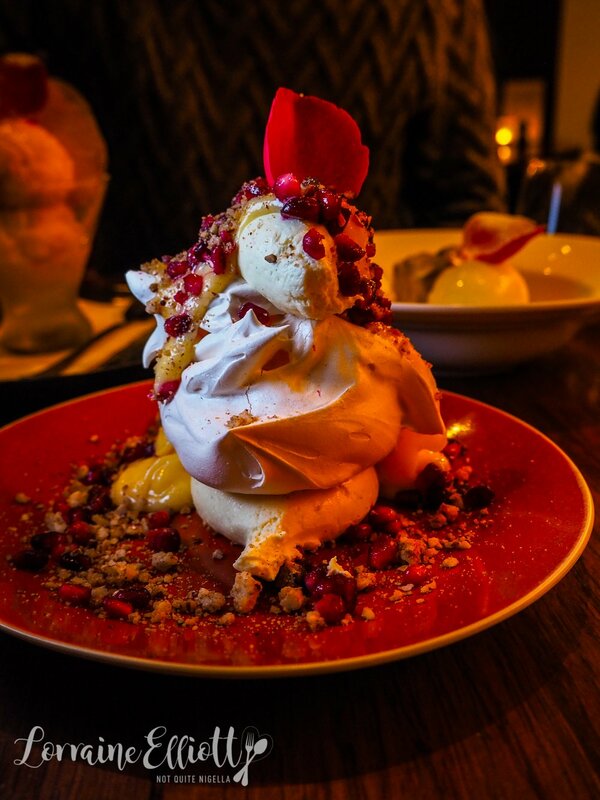 It's a delightfully chewy meringue topped with lemon curd, pomegranate arils and a crunchy pecan praline. My pot of tea comes with some port fudge, just what I felt like, and somehow they just knew! Rushing back to the car we make the drive home and close the barn doors tightly, mindful that the following morning is forecast of a maximum of 4C and a minimum of 2C. I take a shower, tempted by the bath but the late hour and early rise the next day means that I will have to forego that ritual and curl up in bed while Mr NQN takes his job stoking the fire seriously. I fall asleep while he sits downstairs on the stool in front of the fire, watching the flames dance. At 5am he gets up to tend to it so devoted he is to maintaining it. When I wake up at 7am there are snowflakes and I made myself a cup of tea and tend to the fire. With weather like this, you're tempted to stay inside and barricade yourself in with Netflix and cups of tea and potter around the cottage but breakfast at Caffeine & Gasoline and chocolate beckons. 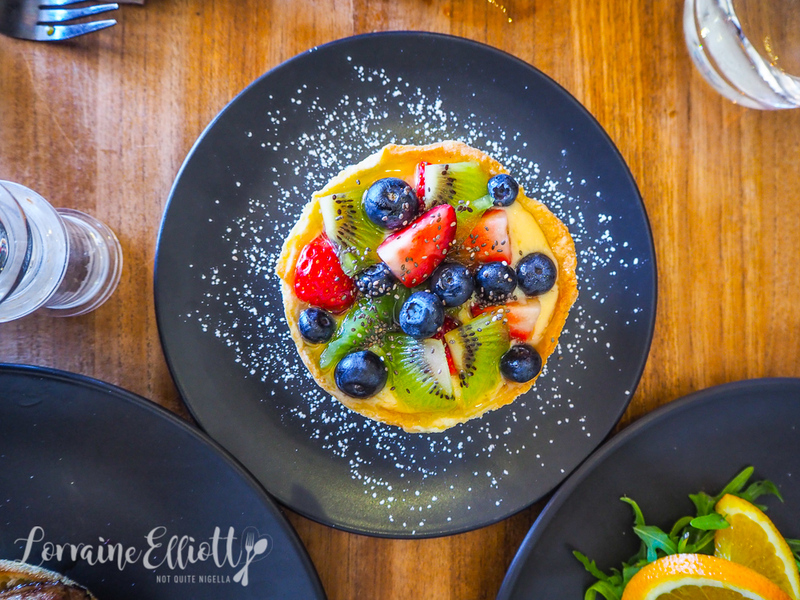 A relatively new addition to Leura, the popular cafe opened in July 2017. 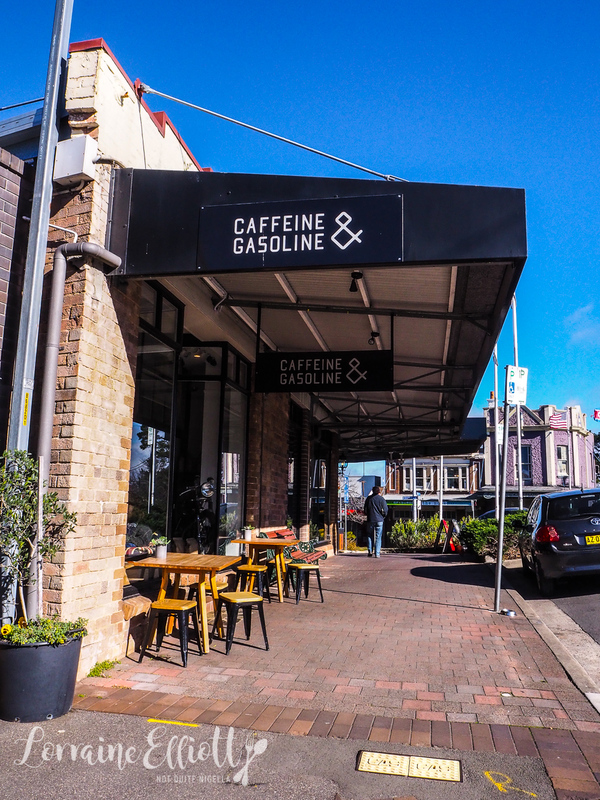 It's based on owner John's two loves: cafe racers and coffee. 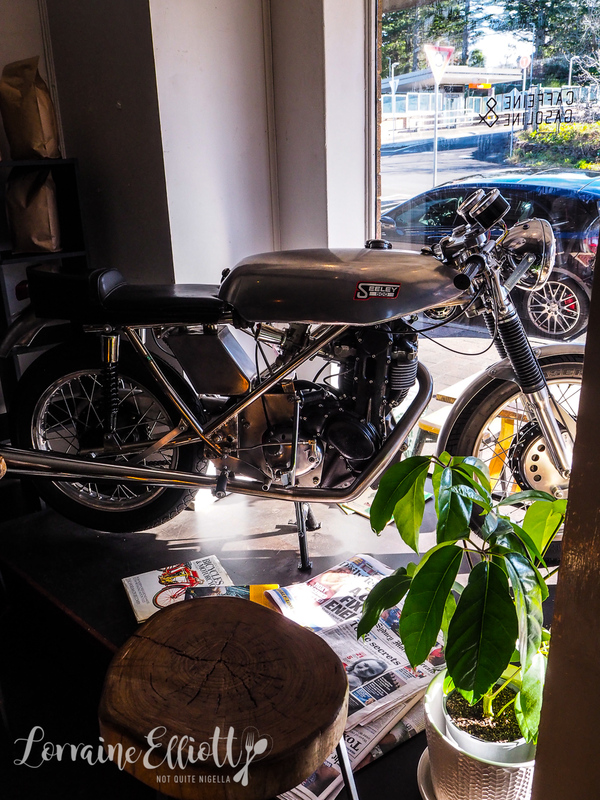 There's a 1960's cafe racer in the window and you can also curl up in the other window to sip your coffee or pull up a chair and table. 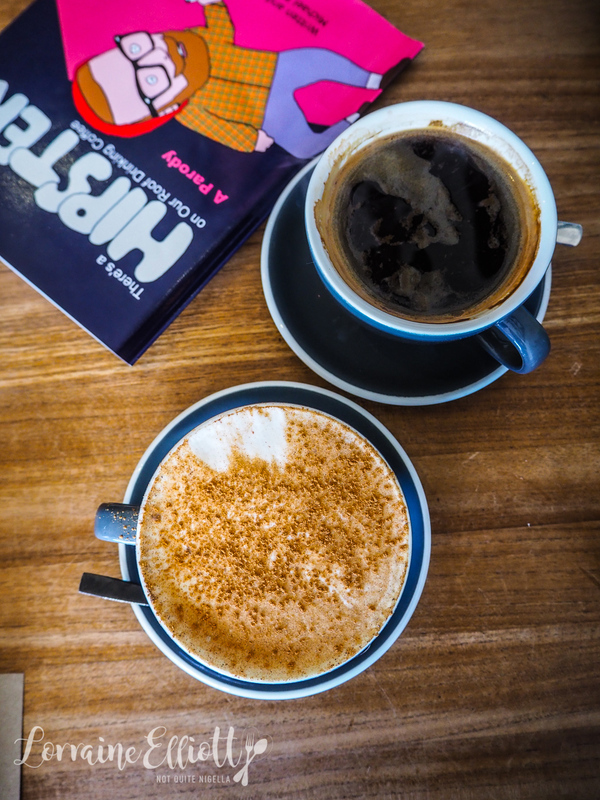 We start with giant cups of Single Origin chai latte and a long black. Service is absolutely lovely and very welcoming. They have a small kitchen so the food menu is small and if you're after something simple but delicious then go for sausage and egg muffin. It's a Duck, Fig & Brandy Sausage with a soft centered poached farm egg and a tangy house made hollandaise. 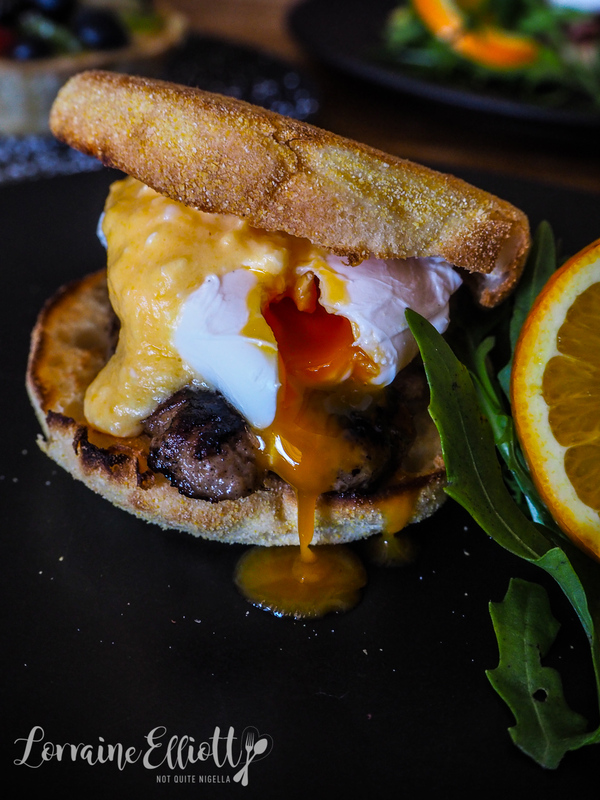 The sausage is so full of flavour and goes well with the hollandaise and runny egg yolk. 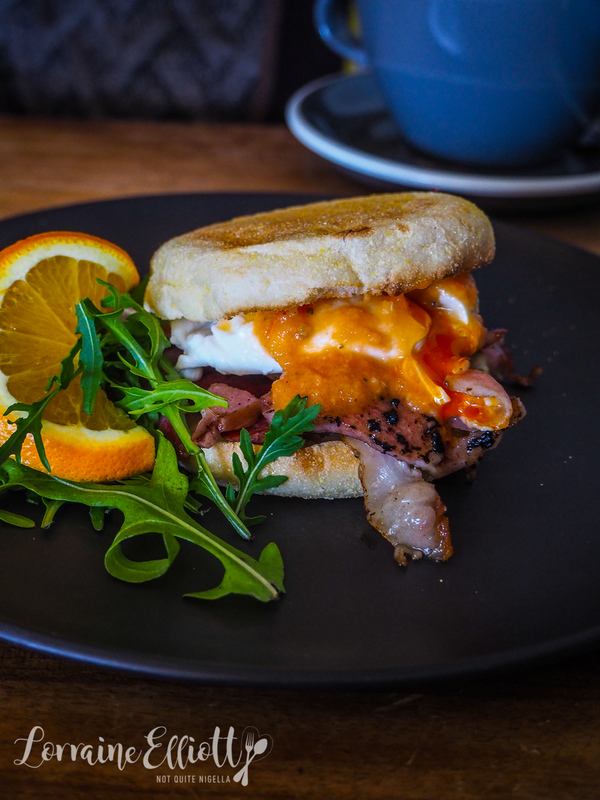 Mr NQN being the contrarian prefers the other muffin with thick cut ham, poached egg and house tomato relish. For me I would have loved some more tomato relish for this and perhaps bacon instead of ham for more flavour. 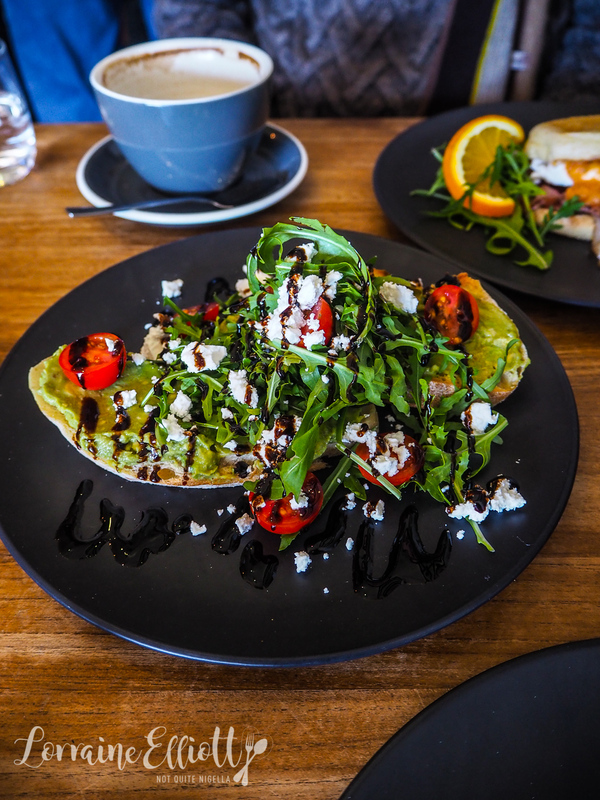 And because we were hungry we couldn't resist an order of avocado toast with crumbled Danish feta, creamy avocado, sweet cherry tomatoes, rocket drizzled with a balsamic glaze on slices of white sourdough. And to finish, a house made fruit tart with a thin pastry crust and a creamy vanilla custard topped with fresh fruit! You can always tell when there is snow fall outside. People look excitedly up in the sky before zipping themselves up and rushing around. It's a moment of joy before they realise that the temperatures have indeed plummeted. Our strategy is simple-when it snows or gets chilly, eat chocolate. Around the corner at Josophan's chocolates, it is chocolate heaven. Josophan's is actually the amalgamation of three names: founder Jodie Van Der Velden and her daughters Sophie and Hannah. Jodie's original life plan was not to become a chocolatier but a twist of fate that included a head on car accident turned her life around. She was working in a corporate job and raising her two daughters. At night until the wee hours of the morning she was making chocolates and then going home to get some sleep and then working her regular job. Something had to give and on one fateful night she fell asleep at the wheel coming home from Sydney. She broke her sternum and spent a week in hospital but knew she had to have a job that provided her with flexibility and that meant she needed to own her own business. 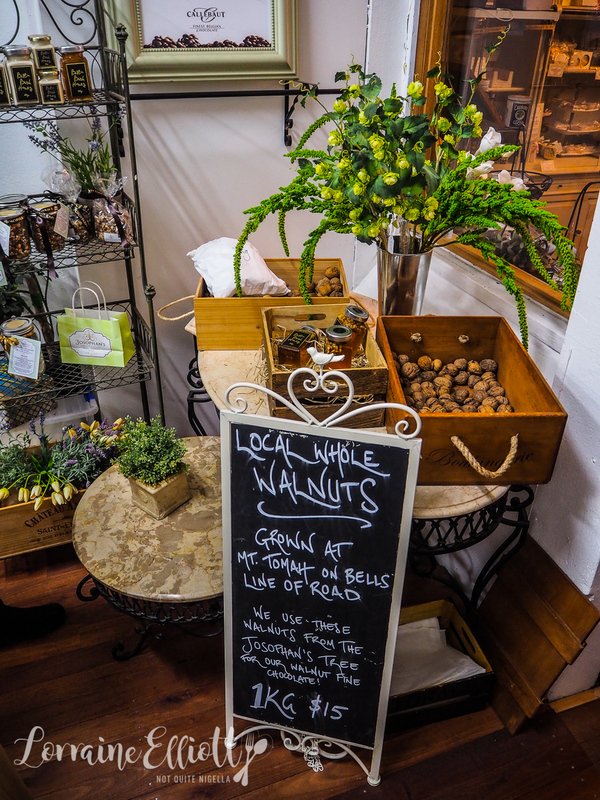 Today all of Josophan's chocolates are made on site at the Leura location. 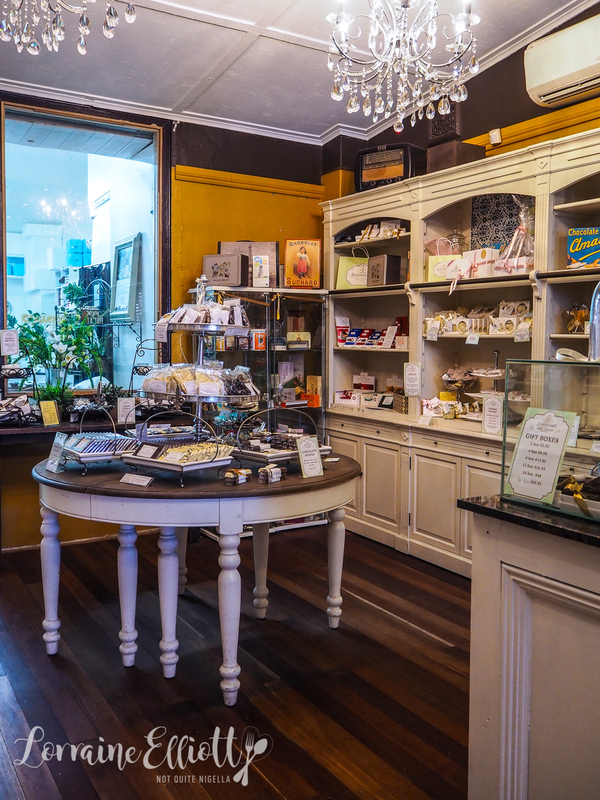 Jodie made the decision to close down the Sydney store after five years as that would have meant evolving to a larger industrial premises and she wanted to keep the chocolates as artisanal as possible. 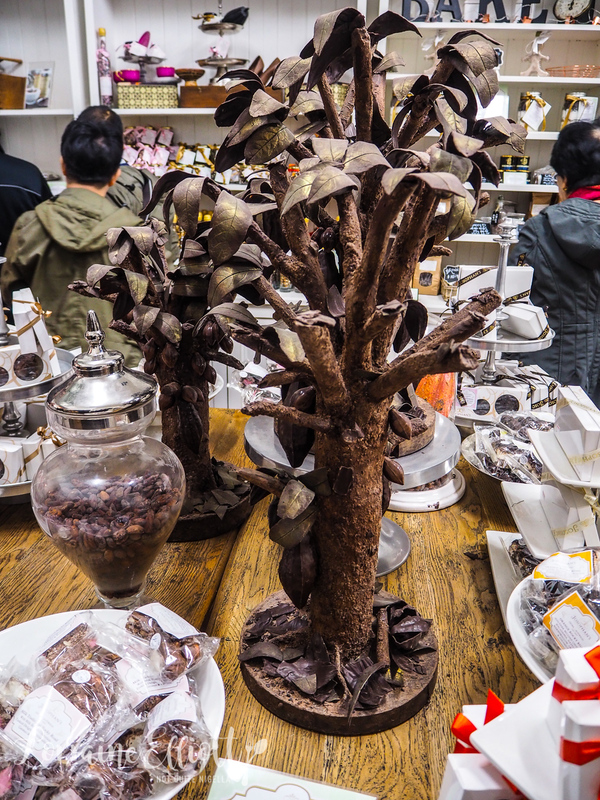 She mostly uses Callebaut fair trade chocolate in her creations making 70% dark, 20% milk and 10% white chocolate. It is astounding to see the product range in store-there is literally a chocolate to suit everyone's style or occasion. 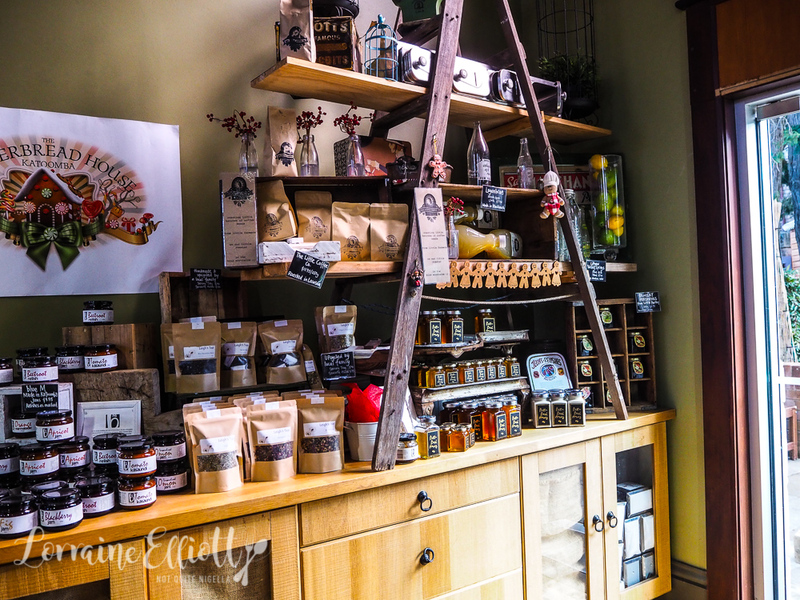 She uses no preservatives or additives and sticks to natural infusions and flavours using real ingredients. They use between 15-20 tonne of chocolate a year. 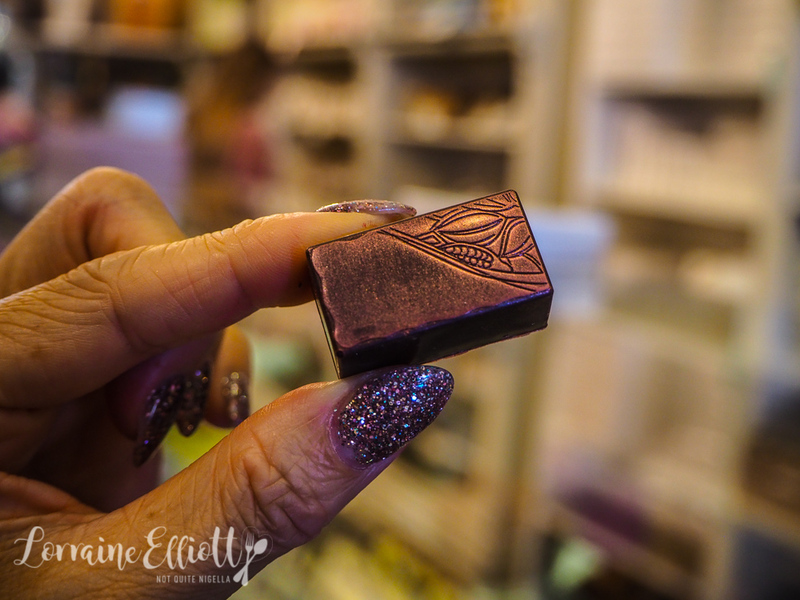 We try some of her individual chocolates- the Caramel Cabosse is a sophisticated take on a liquid caramel chocolate with caramel made in old French copper pots taken to an almost burnt caramel stage giving it an appealing flavour beyond just sweet. 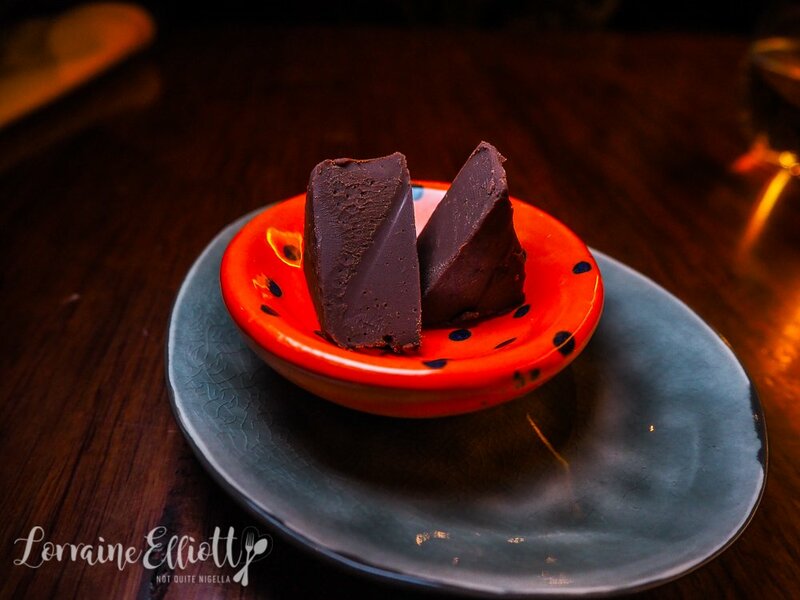 The strawberry and balsamic is divine and is my favourite along with the walnut made using local Mount Tomah walnut halves set atop a chocolate filling infused with French walnut liqueur. These are jewels from heaven. 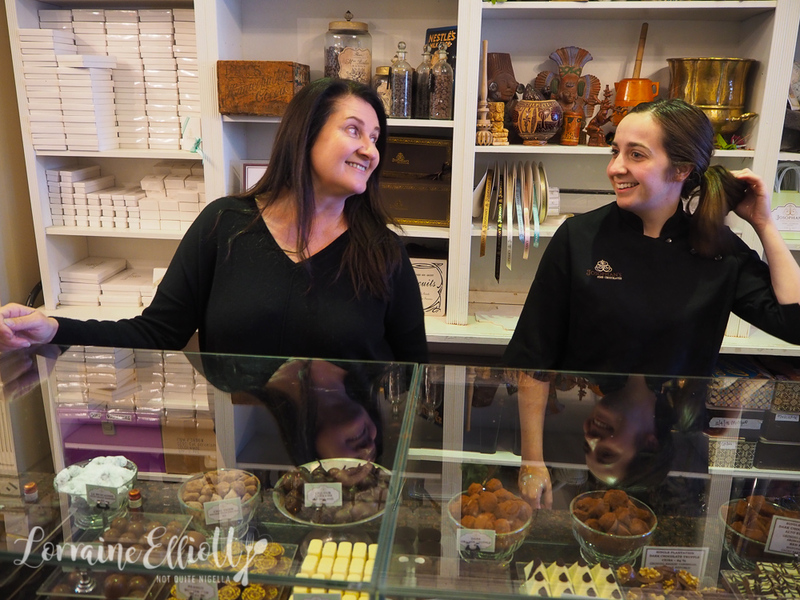 Her chocolate rolled truffles come in a variety of flavours and are rolled in cocoa-Jodie knows all there is to know about chocolate and the process making it and is an enthusiastic teacher. She tells us that not all cocoa is the same. When the cocoa butter is extracted from the cacao mass the poorer quality cocoa has no traces of cocoa butter making the cocoa dull and bitter whereas the cocoa they use has at least 24% cocoa butter in the cocoa powder. Her next chocolate creation? It's an ode to her late father who recently passed away. He was an avid whisky drinker and taught Jodie how to drink whisky. They started the collaboration just before he passed away and it will be made up of his favourite whisky and flavours. 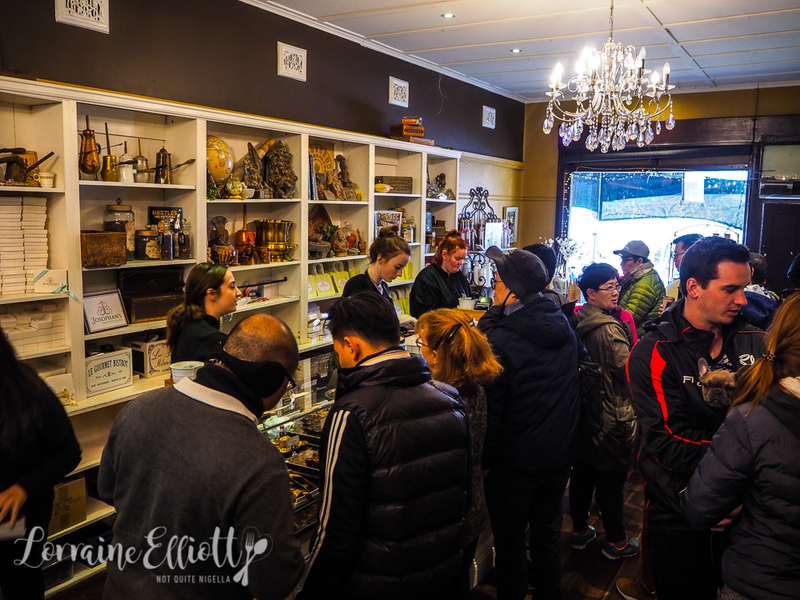 With our tummies full of delicious chocolate we bid Jodie goodbye and go for a bit of shopping in Leura. I stop into Ikou and buy some bath salts with plans to make use of the claw foot bath in the cottage that afternoon to try and warm up and I pop in and out of boutiques escaping the snow, side stepping people and their adorable clothed pooches. Before we know it, it's time for lunch so we head towards Echo Point. 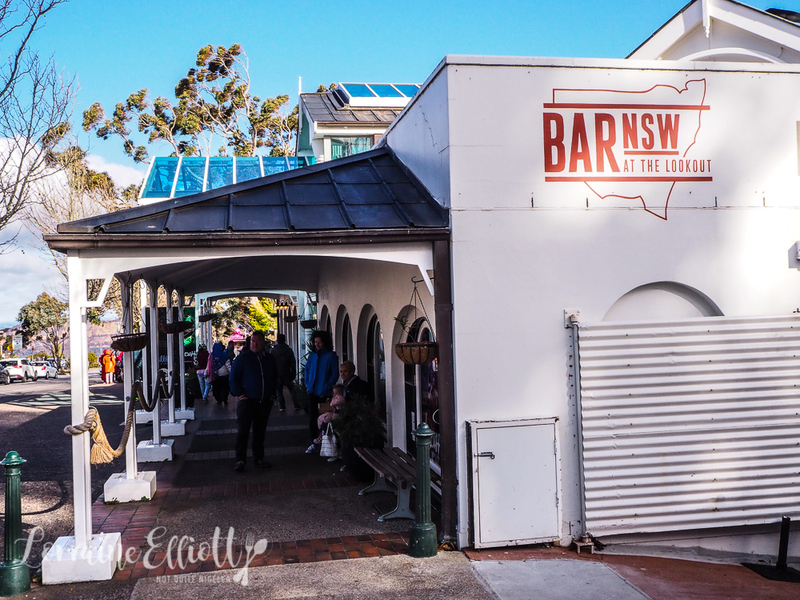 Bar NSW is a multi storey building with a milk bar, bar and shops. Usually on a nice day you can go out on the terrace but the wind is howling so we head towards the Bar. The concept here is that all produce and wines are from the NSW region so if you're a visitor and want to try NSW wine you can do so here. The Enomatic wine system allows people to purchase samples of wines that start at $2-3 each and then if they like them, they can buy a half or full pour. The wines do rotate but at any one time you'll find one from Orange, Mudgee, the Southern Highlands and the Snowy Mountains. We try a couple before I settle on a glass of Durif from the Snowy Mountains. We also order a glass of deliciously hot mulled wine with our food. 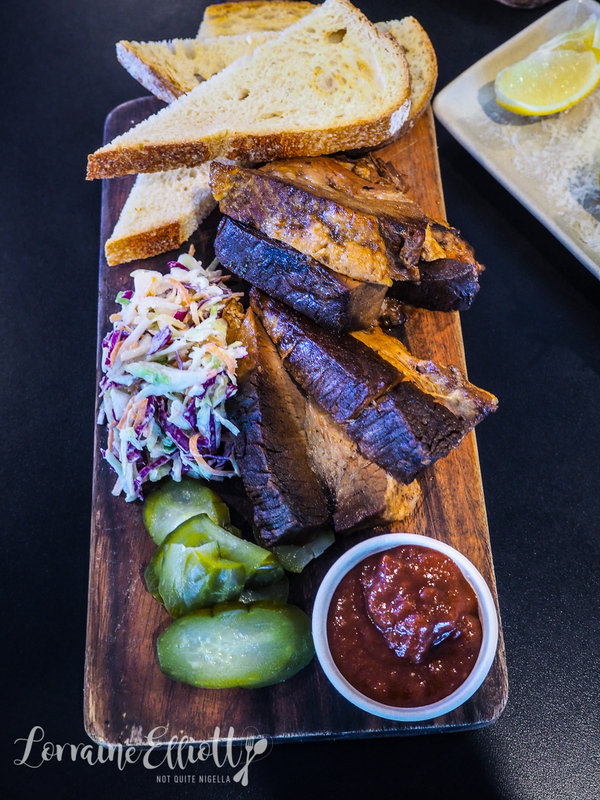 The menu is a bit American with a twist with items like upmarket hot dogs, soy beef brisket and burgers. 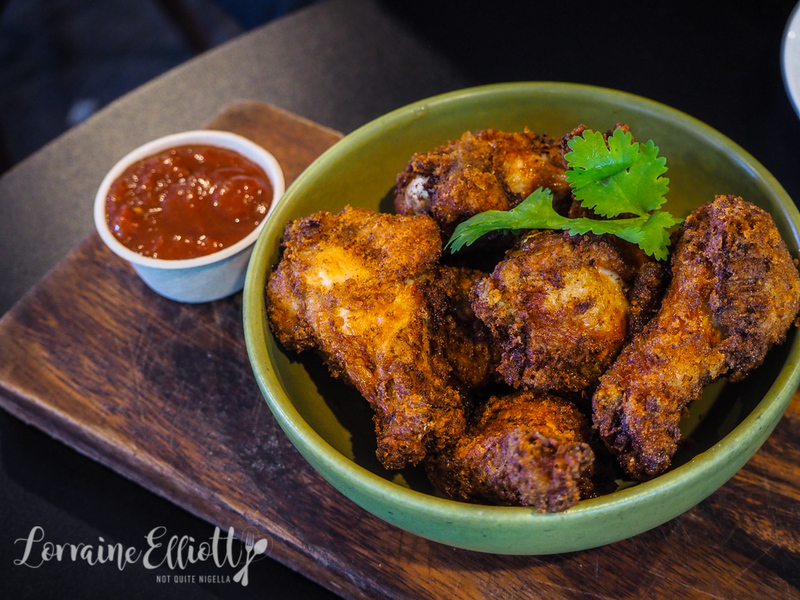 I enjoy the crumbed, fried chicken drumettes that are juicy and served with a barbecue sweet sauce on the side. I also dip them in a bit of the mayonnaise from the corn below too. 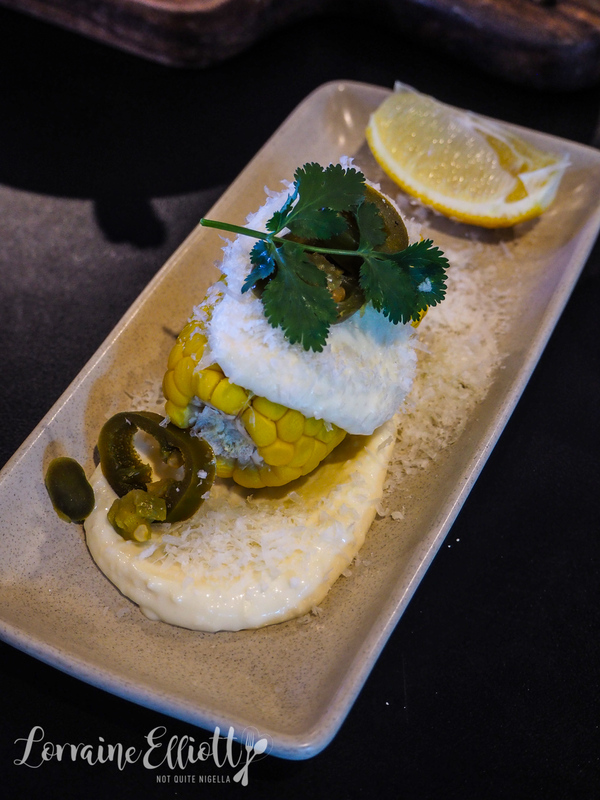 The corn isn't quite grilled, it's boiled but it is served with grated parmesan and a delicious garlicky lime mayonnaise. I wish we had ordered one each though. We take a look at the Three Sisters-at first they're shaded by clouds but then the sun passes by and lights them as if on cue. Chilled to the bone we decide that it's time to avail ourselves of some hot chocolate so we take the short drive up to the gingerbread house where a gingerbread emporium awaits us. Housed in a 100 year old converted church complete with stained glass windows The Gingerbread House is an ode to all things gingerbread. Want to decorate a gingerbread man? You can do it at any time here. 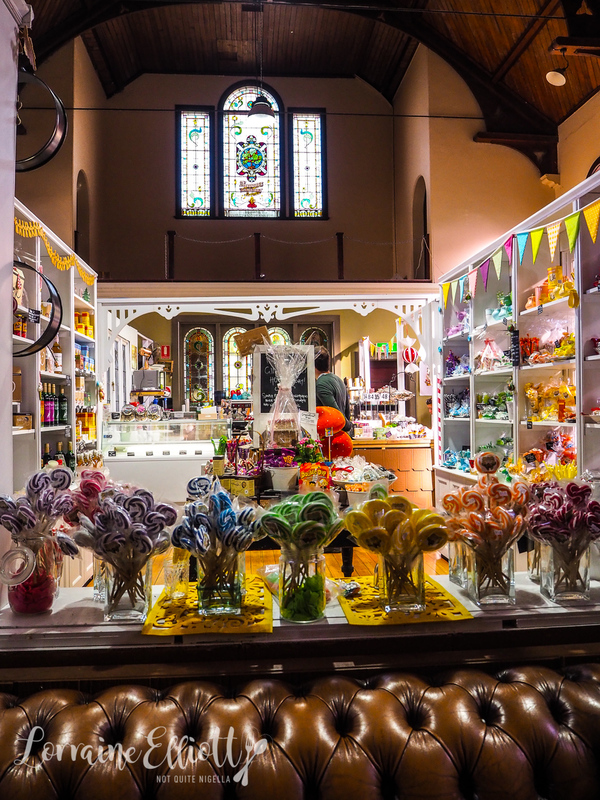 There are lots of kids activities and for non kids there is a gorgeous little sweets shop that has some unusual finds, especially if you want to make your own gingerbread house. 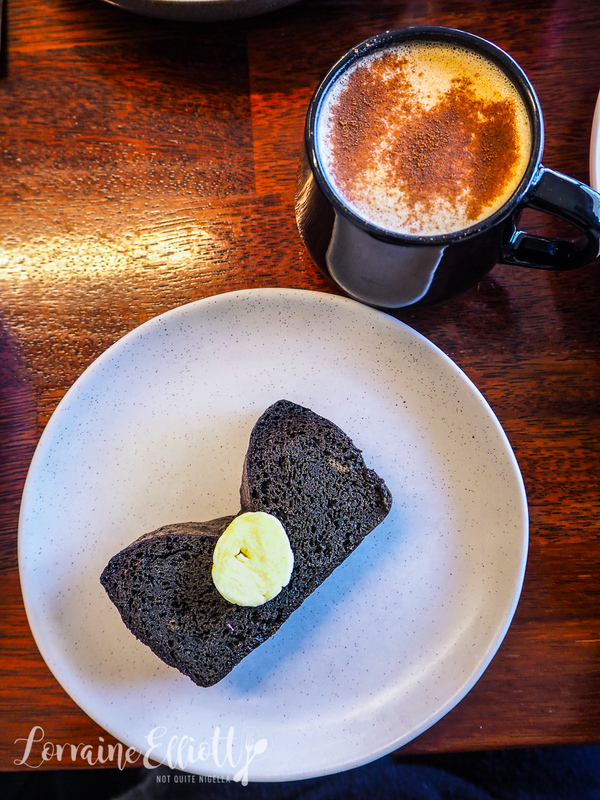 There is a breakfast and lunch menu but we are seeking solace from the cold in the world of Christmassy spices and hot chocolate so our order consists of a hot chocolate tasting flight, a "magical witch's brew" and cakes. The Gingerbread House is owned by Josophan's so all of the food is from there. I had to order the Mexican chocolate cake with shards of Belgian dark chocolate on top. It's gooey, oh so gooey and delicious. If you are in the mood for a serious chocolate hit, this is it. But if ginger has tickled your olfactory senses, the ginger spice cake is a must order. A dense, dark cake with molasses flavours and lots of ginger spice it comes with icing and a pot of ginger syrup and whipped cream which really add to the cake itself. It's hard to choose a favourite of the two cakes really. 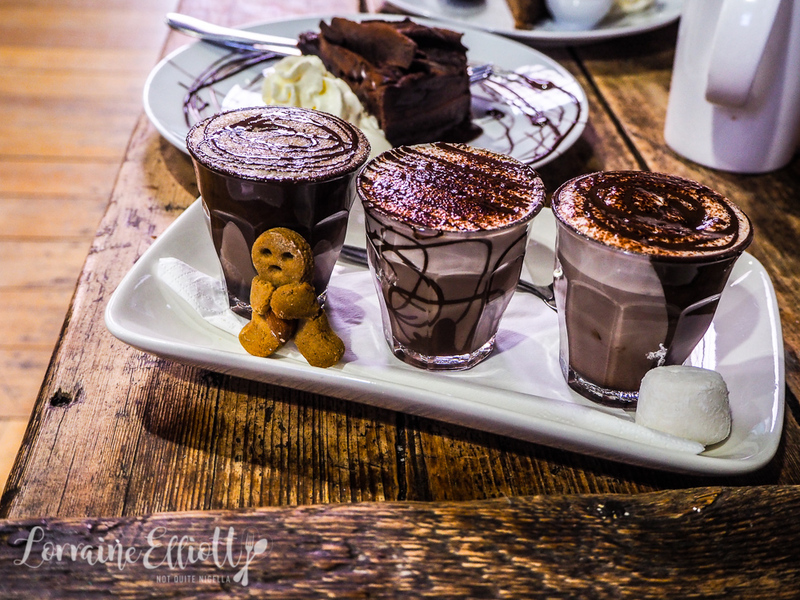 The hot chocolate flight starts with a traditional hot chocolate and also includes the surprisingly spicy chilli hot chocolate and my favourite, the gingerbread hot chocolate which is like a chai hot chocolate with plenty of aroma and sweetness to it. We also order a Magical Witch's Brew-designed to ward off colds with hot water infused with spices and lemon in a tall mug. With the winds getting strong we retreat to the warmth of the cottage. 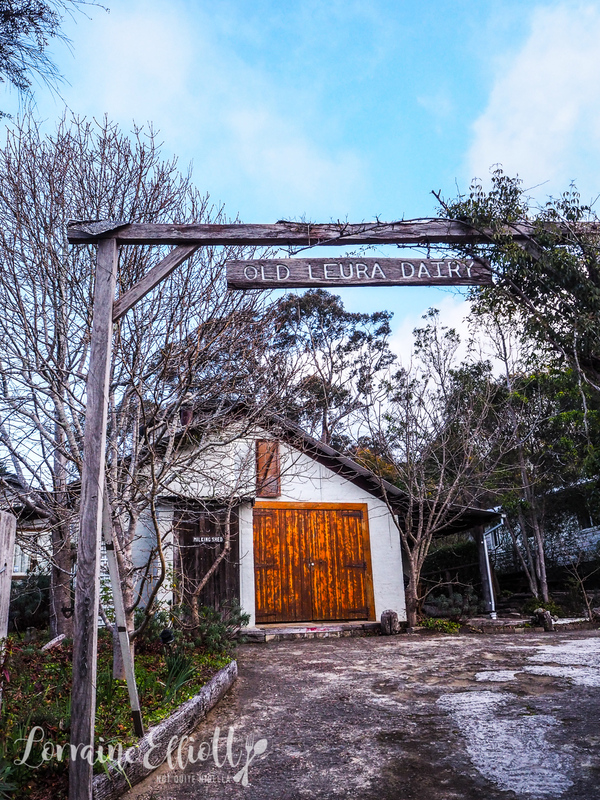 Although the Old Leura Dairy doesn't service cabins for short stays we are delighted to come back and find that they've restocked the firewood and rebuilt the fire. Mr NQN gets this working while I curl up on the couch to work. Time gets away with me and I don't quite get to take that bath. "Wake up! It's dinner time," I rouse Mr NQN from his nap. 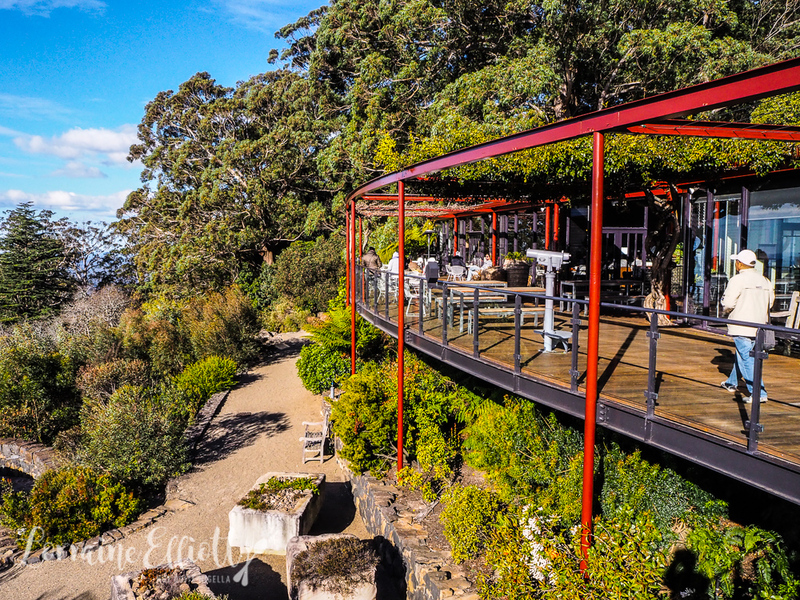 We are headed back to Blackheath for dinner at Fumo on Govett's Leap road. 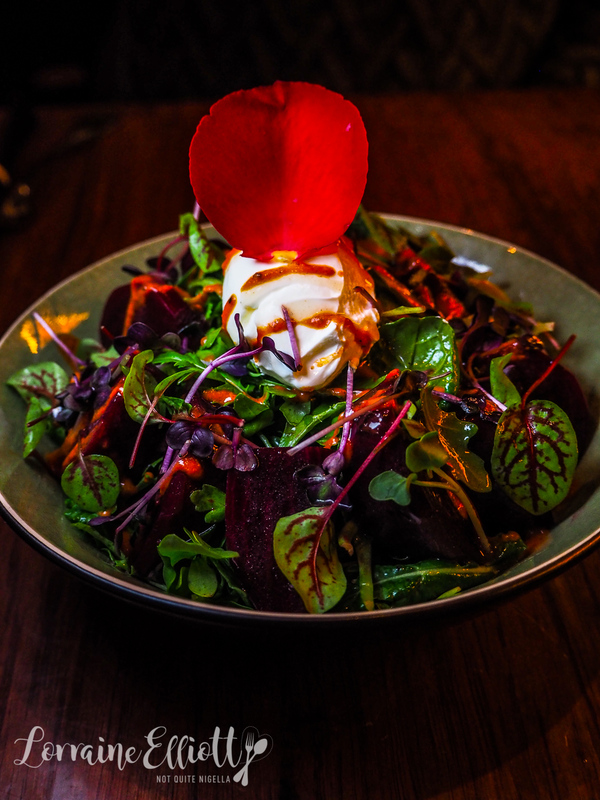 Chef Joe Campbell built up a following at Vulcan's and Red Door Cafe and at Fumo he creates food with a Japanese twist-an interest borne from his travels there as a keen snowboarder. Fumo is Italian for smoke and this references the enormous wood fire oven. We are lucky enough to get a look at it in all its enormous glory. Joe is clearly proud of the oven, "Everything goes into this oven except the ice cream bombe," he says. It's the size of a room and is powered by a small chamber to the right. We start with some sake and an entree of sake steamed mussels with house churned butter mixed with kimchi and shiso leaves. A big tip: get a serve of bread each because there are some delicious sauces happening here. 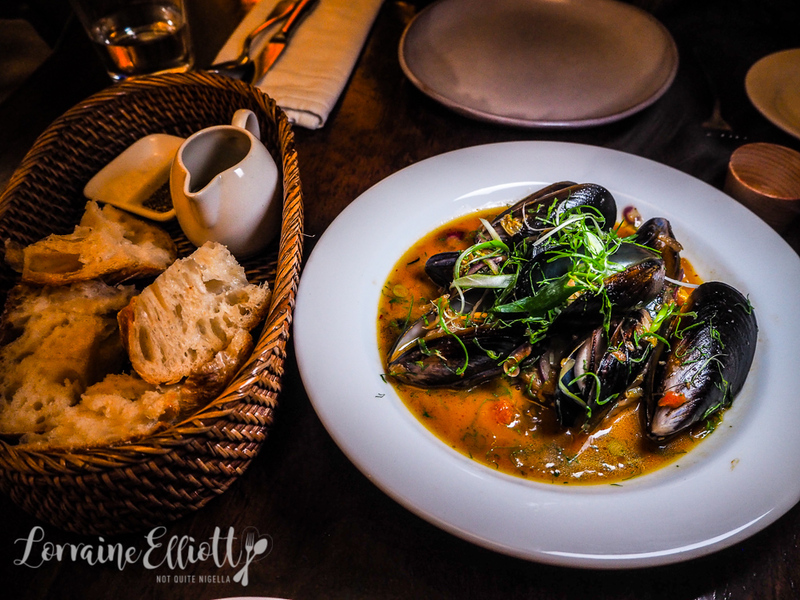 Sometimes the sauce for mussels is more for flavour and not for drinking but you'll want to dunk the soft, fluffy Black Cockatoo organic bread into the soup and then drink it it's that full of flavour. The plump, largeish but tender South Australian mussels melt in the mouth. Mr NQN is a big tofu fan so he ordered this. It's a nice entree but I think it's best to have this before the mussels as it can be quite subtle as opposed to the bold flavour of the mussels. 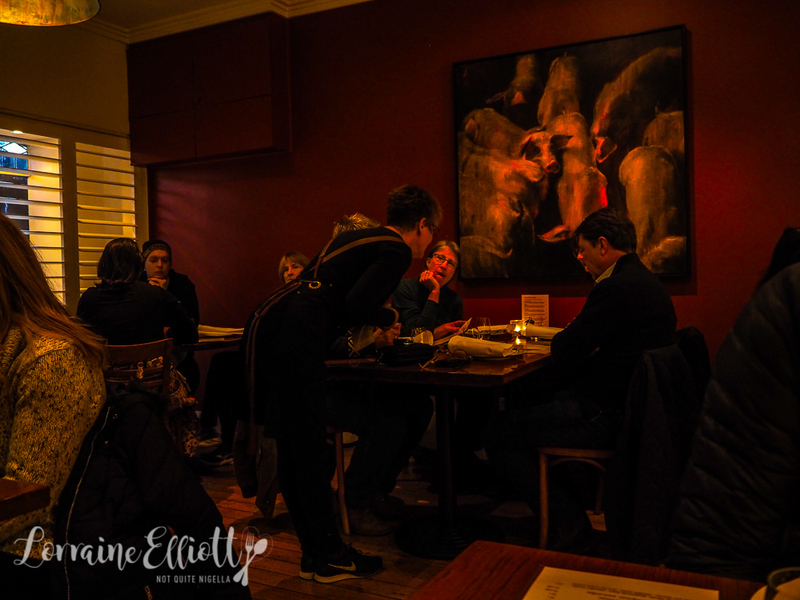 The menu is small but filled with choice-we like the look of the mains so much that between the two of us we order three of them. 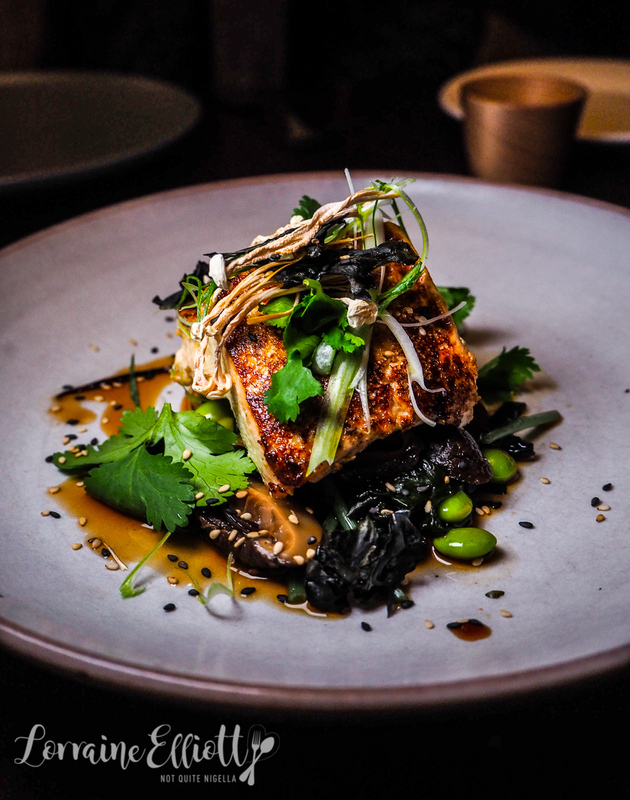 The first to come out is the salmon fillet marinated in yogurt and served with an Indian spiced brown butter with a gorgeously creamy smoked eggplant and a delightful sesame seed sambal for texture. Again this is what that spongey bread is for-that butter that I find myself dipping in again and again. The fish is tender and moist and not a scrap goes back to the kitchen. Next is the spiced duck confit on a bed of wombok and topped with a pickled carrot and fennel salad. 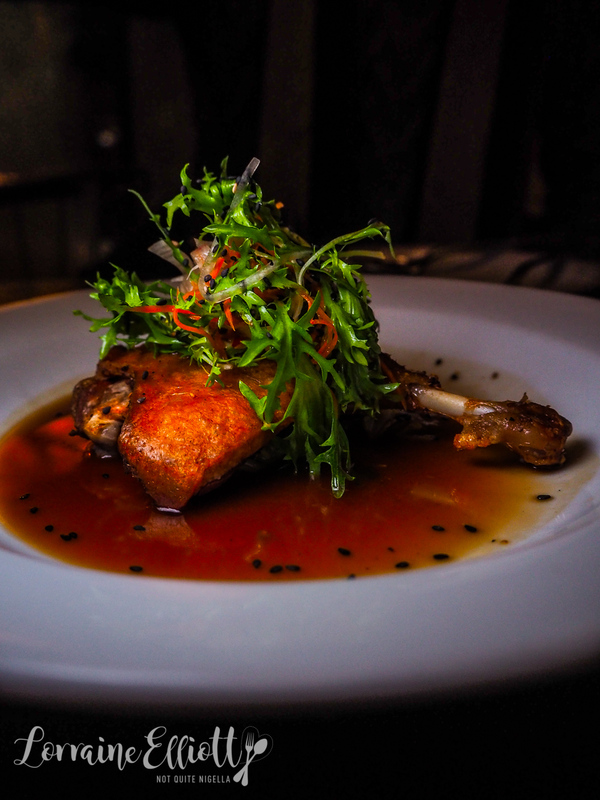 The flavourings really work to lighten the usually rich and heavy duck confit. There is a slight change from the beef short rib - instead it is an oyster blade and this along with the mussels and salmon are my favourite savoury dishes. 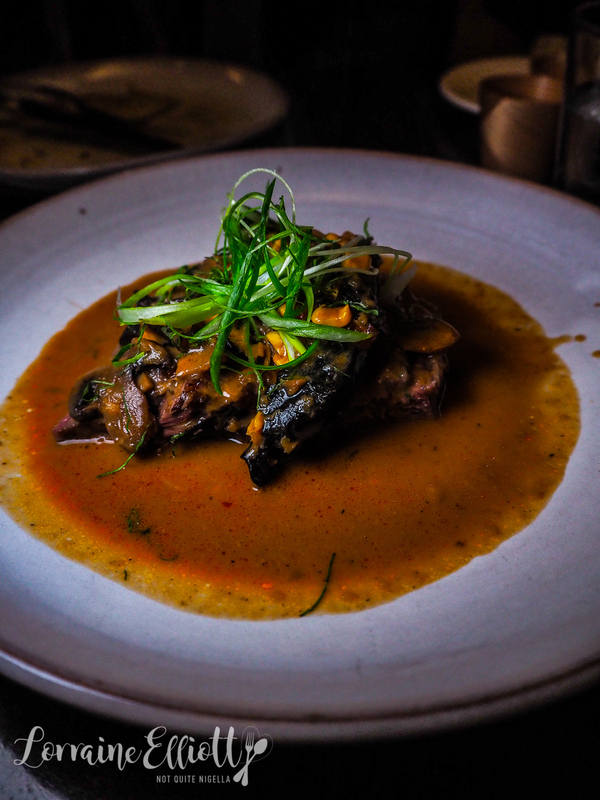 The beef comes sliced with a Szechuan pepper, roasted corn, mushrooms and tomato coconut cream. It crosses all part of Asia yet it works perfectly together. Although we're full and in danger of possibly exploding, I keep dipping the bread in that sauce and spearing another forkful of tender beef. "Okay, we'll just order one dessert," I said to Mr NQN and he nods in agreement because we are sensible people (or I feel if we chant this to ourselves then it will come true). 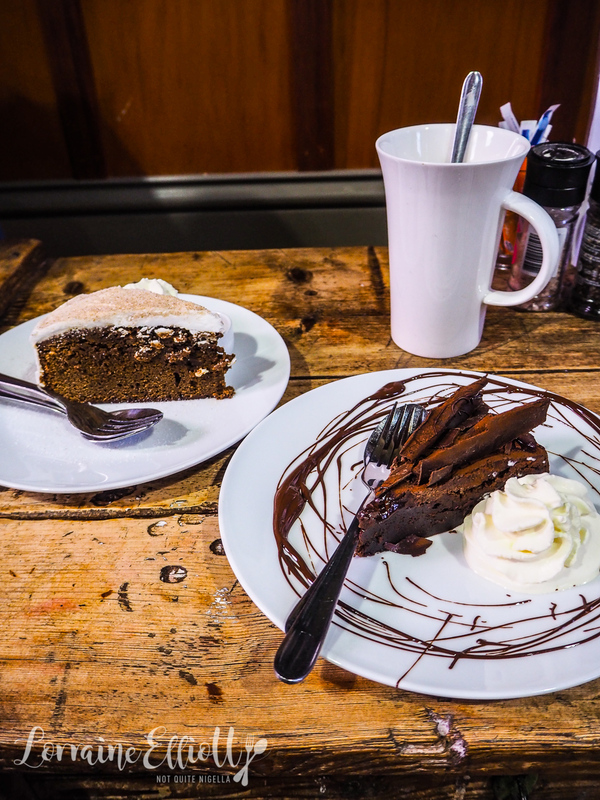 But then they tell us that Joe was always known for his ice cream bombe slice which I had originally dismissed because of the 2C temperatures outside. And it's no ordinary ice cream bombe. 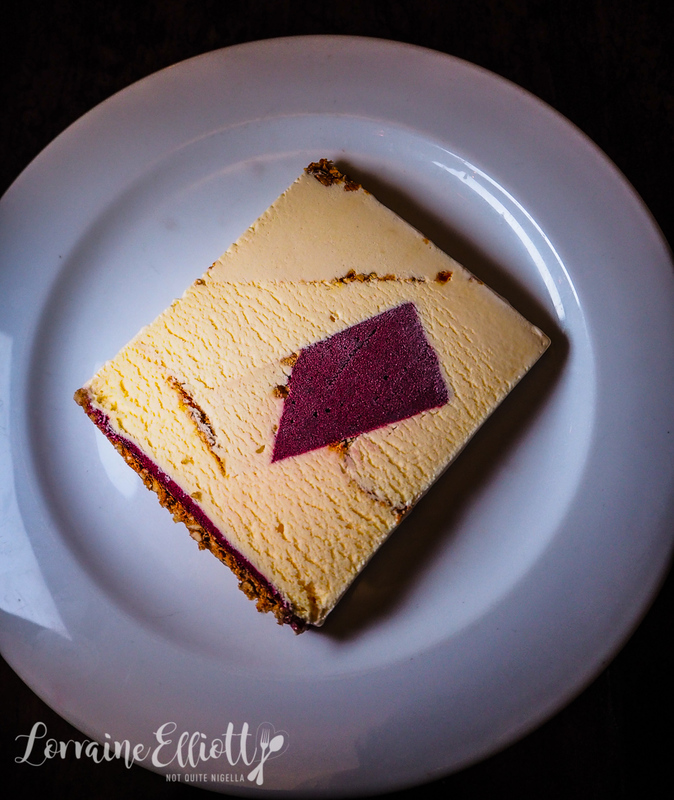 It's actually made up of several different flavours and texture all in the one slice all at different angles like a modern art work. There's walnut macaroons, boysenberry, a blackberry ice cream, praline, a ginger ice cream, mandarin ice cream and a sour cream bay leaf and mace ice cream. Every spoonful is different and it's such a clever idea executed with a flourish. You know the food is good when you are full yet keep on eating. 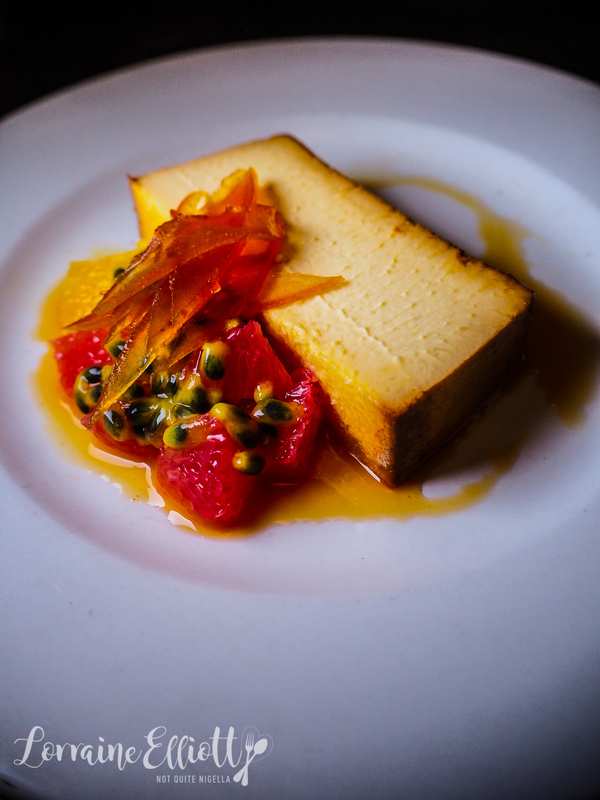 The baked shochu custard is for those that love tart flavours like marmalades. The shochu custard itself is luxuriously smooth, incredibly so, and topped with passionfruit, grapefruit and orange. 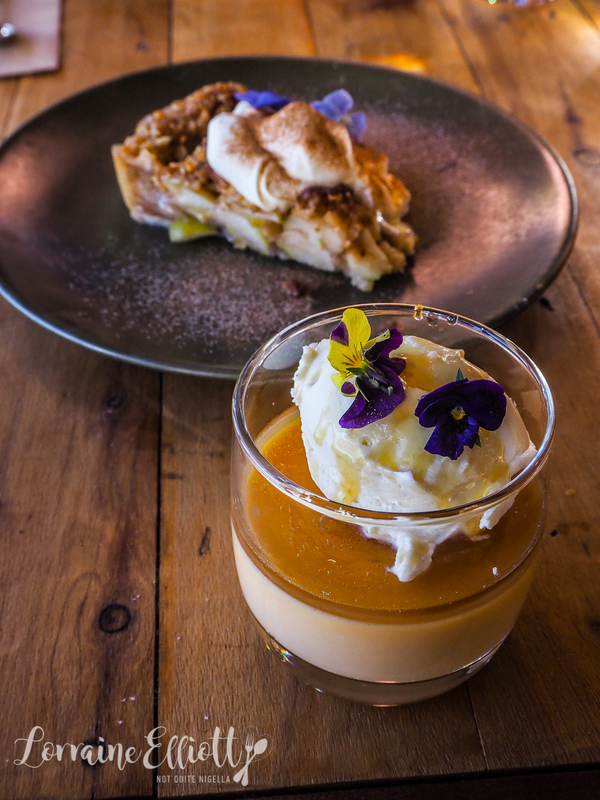 The creamy custard and the tart fruit are a perfect ending to the meal. We take the drive home and pull up as we quickly unlock the barn doors and hurry inside. "The fire is still burning!" I say excitedly. I run a bath, add in the bath salts that I bought that afternoon and relax and unwind in the solace of a quiet bath before going upstairs and falling asleep. The next morning we head back to Sydney but not before one final stop for breakfast on the way home. Glenbrook is at the beginning of the Blue Mountains and a good 45 minutes from Leura and an hour from Sydney. Kickaboom cafe in Glenbrook is owned by Dylan and Alisha Johnson. 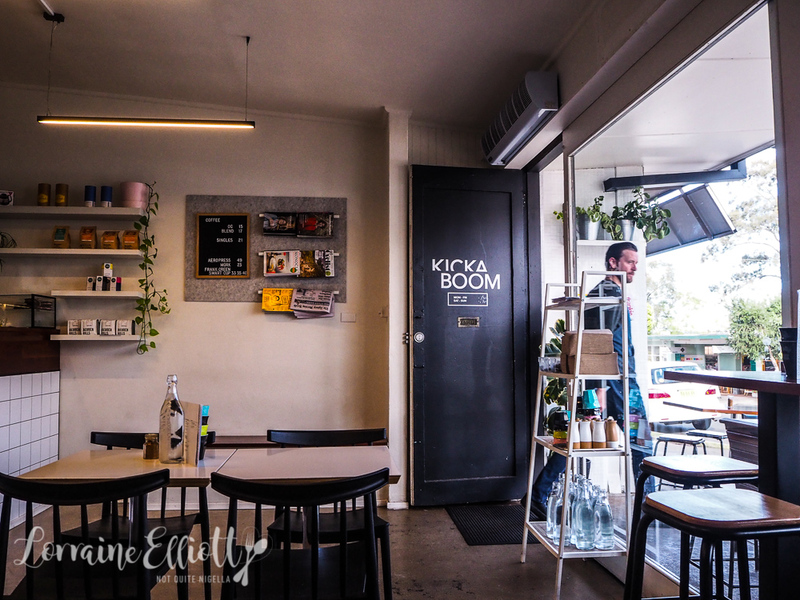 I had heard great things about the food at Kickaboom and when I get there it's like I walked into a cafe in Sydney's inner west - there's a serious coffee menu but then there's the food menu where everything is made in house from the butter, syrups, flavourings and sauces. A word of warning: bring friends because there is so much to try here. Service is super friendly. 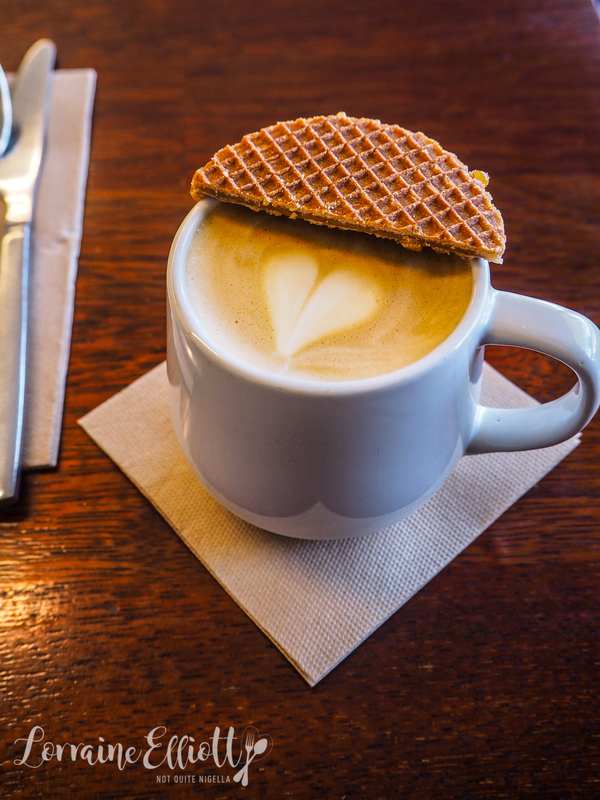 I can't decide on a drink so I order both - the butterscotch latte comes with half a Stroopwaffel on top to melt the sticky caramel centre and my favourite: the speculatte. I love chai lattes and the speculatte is like the supermodel cousin. It's actual speculoos cookies (spiced cookies) with or without a shot of coffee and milk. I would drive a distance for this it's so good. Another thing that they're also known for is their liquorice bread. I'm getting to like liquorice and so I thought I'd give this a go and I end up falling hard for this house made bread. Sweet, licoricey and black as the night thanks to charcoal I think to myself, "I must eat this bread again!". It is topped with a disc of house cultured butter. Owner Dylan says that they do get requests to sell this bread and honestly if they had sold it, I would have bought an entire loaf. Alisha was kind enough to give me the recipe which I will share with you all soon. Ever wanted Black Forest cake for breakfast? 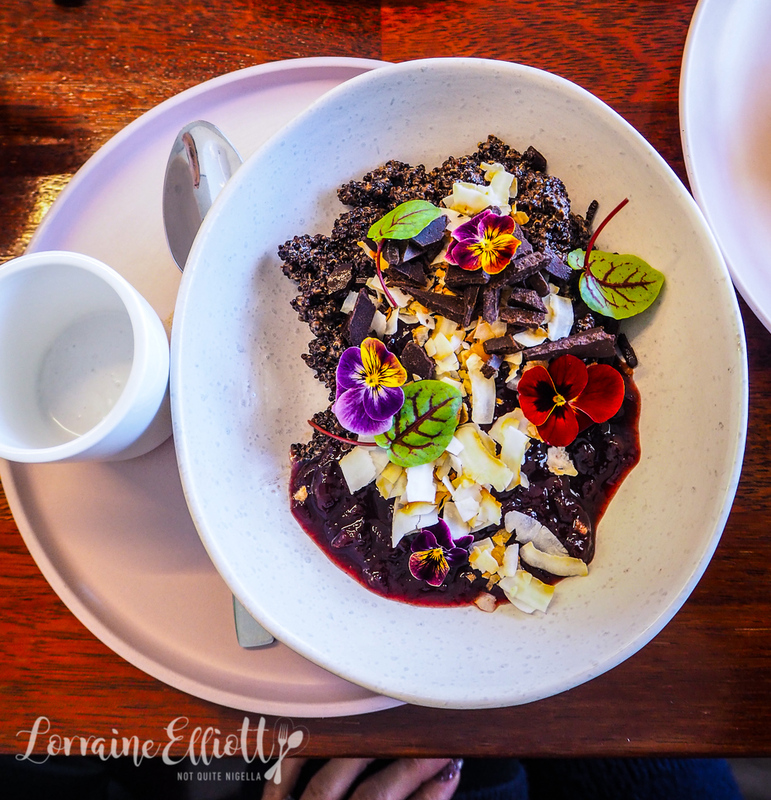 The Black Forest porridge is exactly like a Black Forest cake but in a cacao quinoa breakfast porridge. It comes with a chocolate bark and a sweet cherry sauce and a little jug of coconut cream. I'm guessing the rose French toast is the choice for Instagrammers. 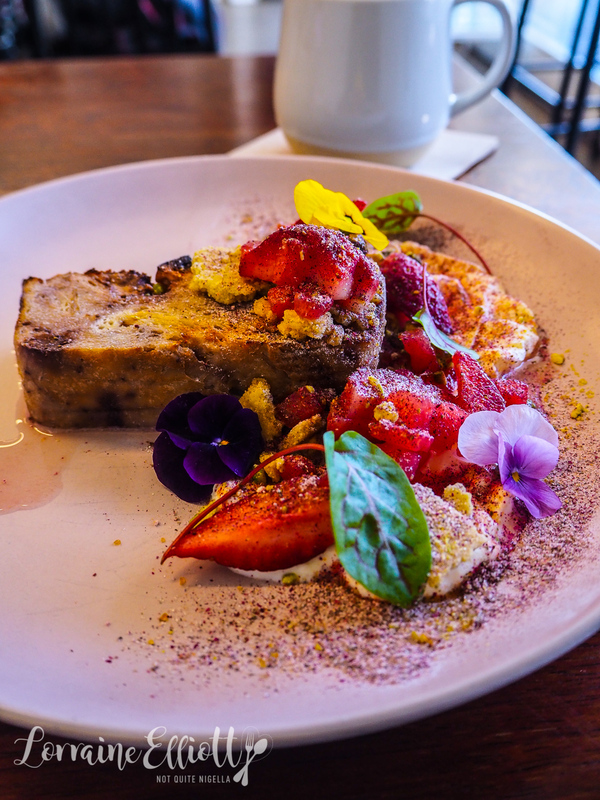 With a slab of crispy edged sourdough pudding and topped with watermelon and strawberry, praline, pistachio shortbread and rose sherbet this is unashamedly pretty and ready for a picture. It's also delicious too so it's not all for show. 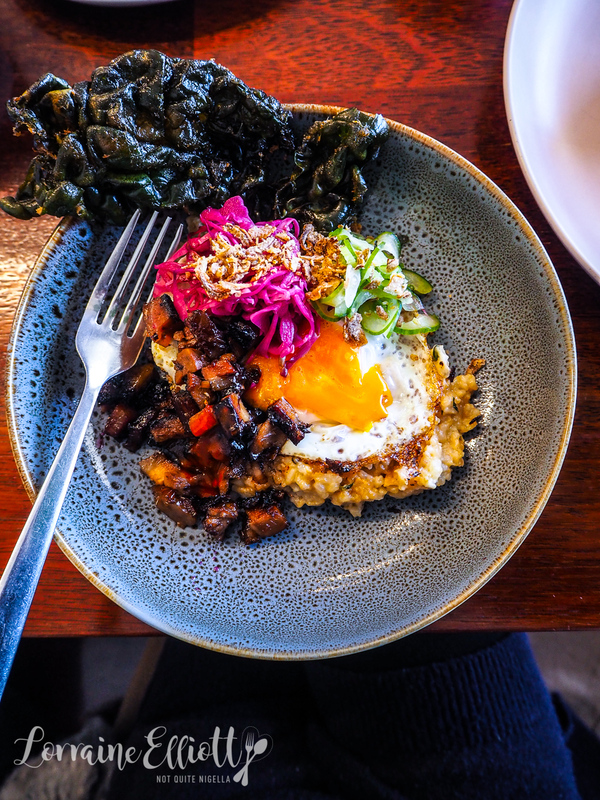 One of the items that Kickaboom are really known for is their sticky pork bibimbap. Although bibimbap is seen as more of a lunch or dinner food this version could really be like ham and eggs for brunch. 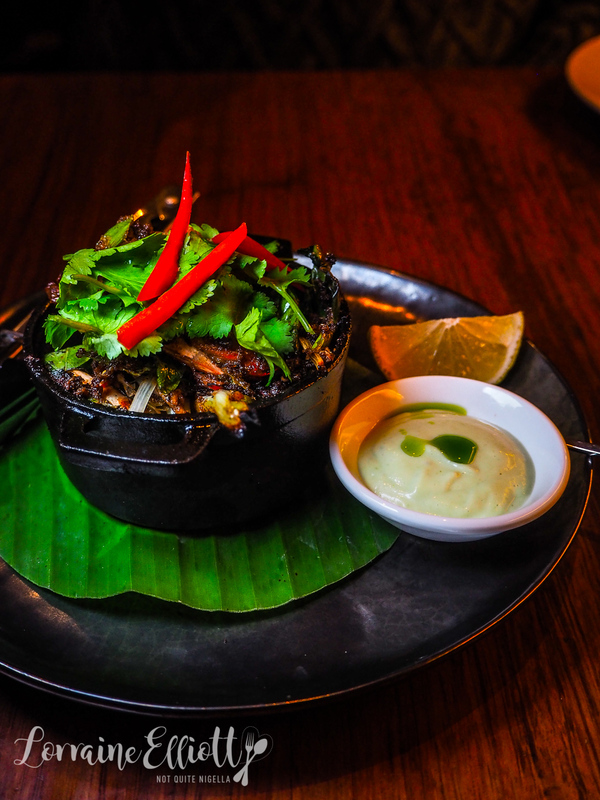 It's a bed of fried rice topped with a cucumber pickle, sauerkraut, Sriracha, tempura green cracker, shallot salad and the star of the show: sticky, drool inducing gingery cubes of roasted pork belly. Heaven. 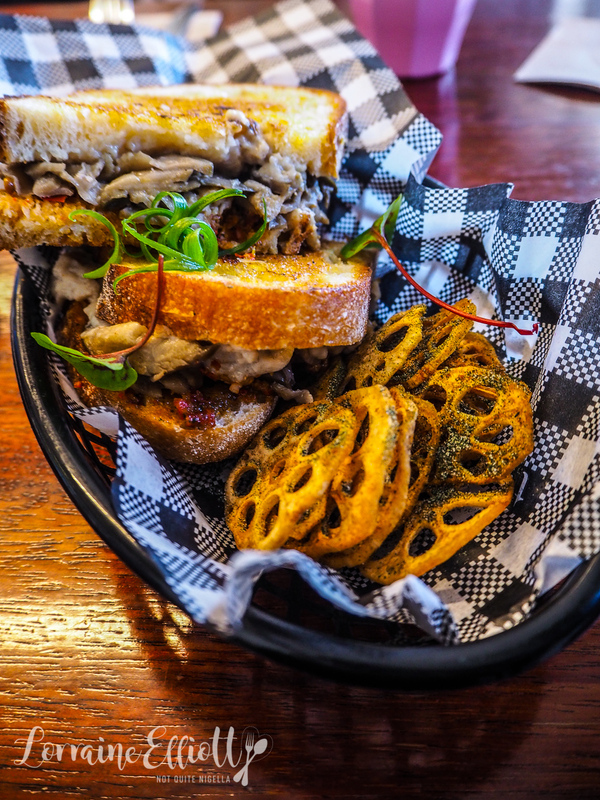 There is a spiced ham toastie but friends had raved about their vegan toastie which is made with miso eggplant, vegan bechamel, house made harissa on sourdough slices with a side of lotus chips with nori salt. Holy heavens, even though I feel I had been eating for a nation this weekend, I devour half of this without stopping. 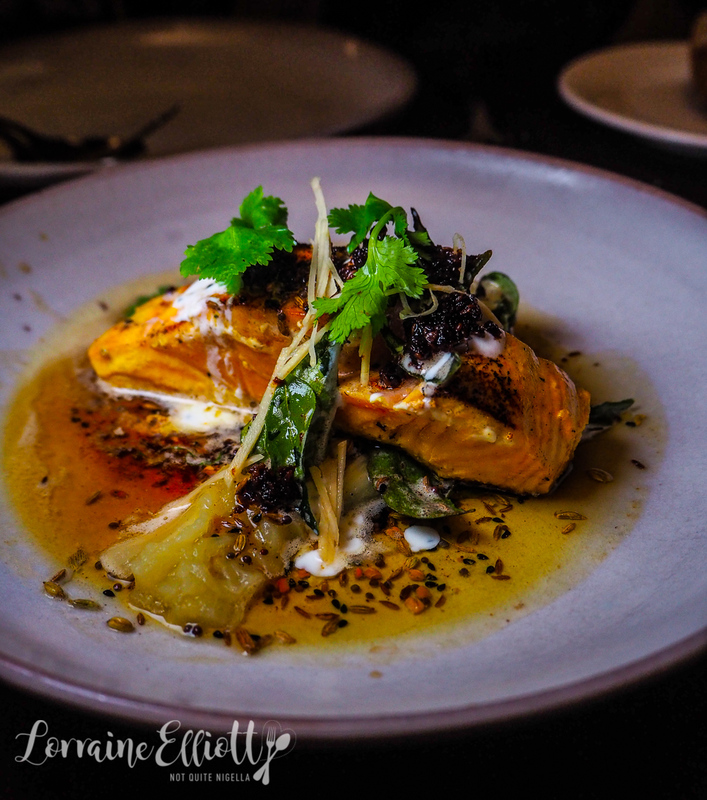 The flavours are bold and really shows that vegan food need not be processed or bland. I wanted to stick around for the butterbing sundae (these guys have their own soft serve machine, yes really) but I was too full to even give it a look. I use the sundae as an excuse to come back to the mountains and not to leave the return trip too long. So tell me Dear Reader, do you like going away for short breaks? How far would you travel for a weekend away? And are you good at tending to fireplaces? NQN and Mr NQN were guests of Visit NSW but all opinions remain her own. travelSpringtime in The Blue Mountains! 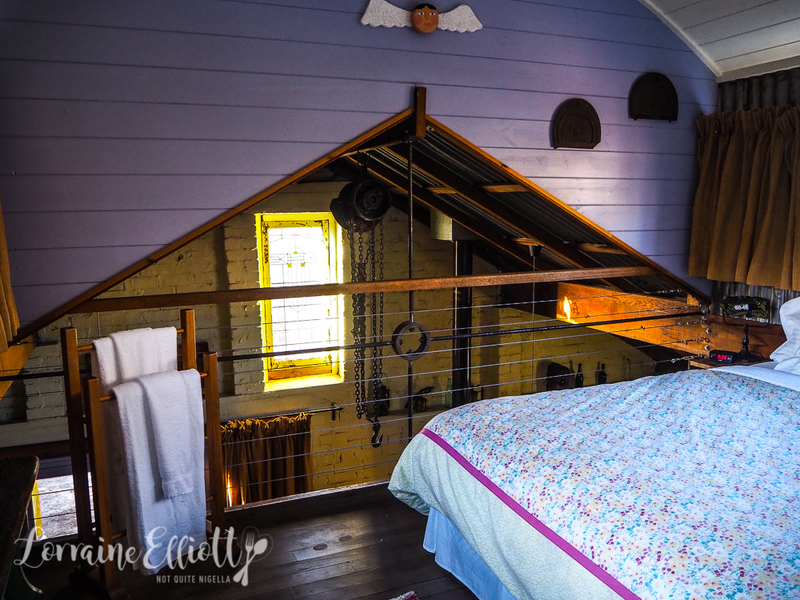 travelA Girls' Weekend Away In The Blue Mountains! 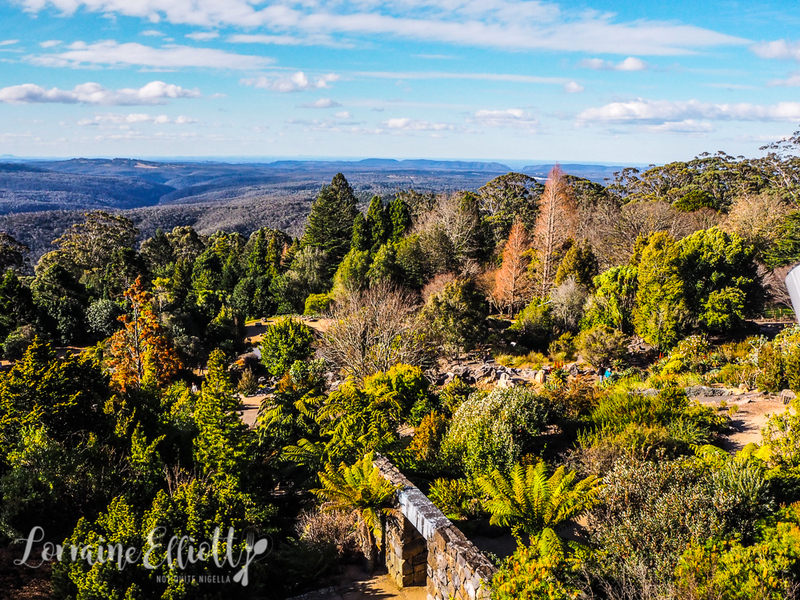 travel Springtime in The Blue Mountains! 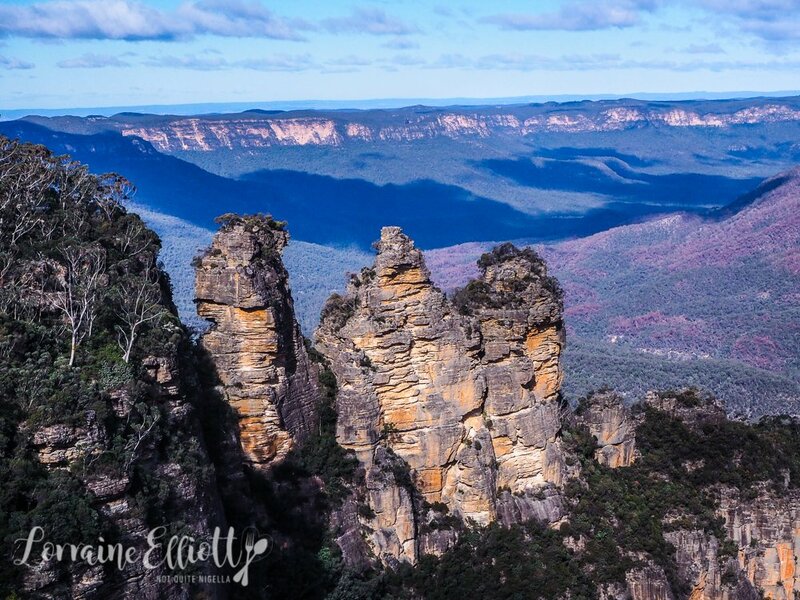 travel A Girls' Weekend Away In The Blue Mountains!